I started talking about manipulation of samples by describing The Black Widow, a PureData patch for controlling up to 4 samples using a flight simulator-type joystick control, and the Black Widow II, with improved features and an automatic mode. I also described two other applications by Karlheinz Essl and Kevin Holland (Sineqube) which work similarly, manipulating 4 samples in real time. 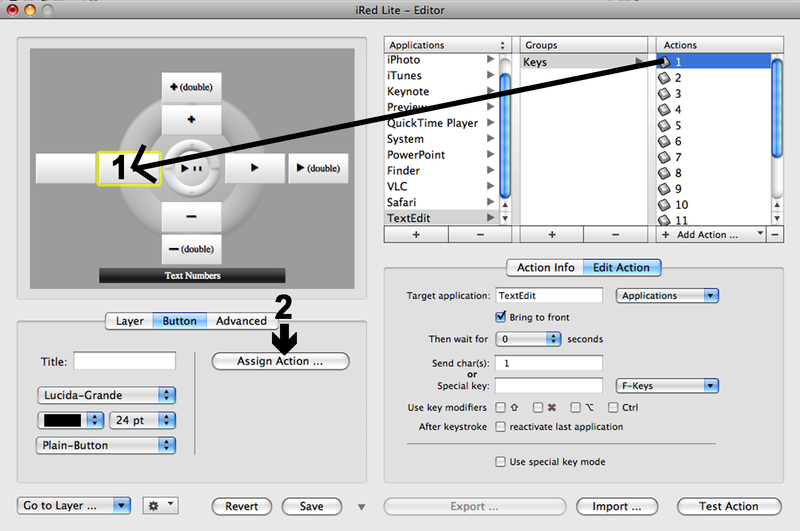 The third post in the series described two applications which work in real time to manipulate a single, longer sample. This post covers some non-real time methods of working on samples, often known as ‘Databending’. The basic idea of databending is very simple: open a sound file with an application it’s not meant to be opened with, change the file in a semi-random way, then save it. When you play it again as a sound file, it will sound different from the way it sounded originally. Often quite a lot different. Some good advice on how to do this can be found at http://www.intelligentmachinery.net/?page_id=29. First of all, what sort of files does it work on? I’d say you should always start by trying different formats of the same sound file – certainly an uncompressed format like aiff or wav, and a compressed format like mp3 or flac. There can be a big difference in the results. Once you’ve tried a particular technique on two or more formats, you might decide it generally works better on one of them, and then concentrate on that one; the next technique you try might work more effectively on another type. Secondly, try some files with different musical content: one file with, say, fast percussive content, another with slow, sustained passages. A particular technique might suit one style, but not another. Next, what ‘other’ applications could you try? Text applications are always good. All files can be displayed as text, as you will have noticed if you’ve ever had occasion to read one – trying to open a pdf in Word by mistake, for example. It generally looks like gobbledygook most of the the way through, although there’s occasionally a ‘header’ at the beginning with some readable stuff in it. Sometimes, even the mere act of opening a sound file in a text program and immediately saving it can make significant changes to the way it sounds when you play it back again. Notepad in Windows or Text Edit on a Mac can be used in this way. Provided you save the file as ‘text’ and keep the extension (e.g. ‘.wav’ or ‘.mp3’) the same, you’ll be able to play it back. The first example shows this. The first extract is from the original sound file I used; the second extract is the file opened and saved in Notepad on a PC; the third extract is the file opened and saved in Wordpad. Once you’ve got the file in a text editing application, however, there are many things you can do with it. I’ve tried the following and got some interesting results: changing all lower case letters to uppercase; changing all zeroes to 1’s; changing 1’s to zeroes; cutting and pasting text from other places into the middle of the file; and swapping bits of the file around. Occasionally you’ll end up with a file that won’t play at all, occasionally a file that sounds exactly the same as it did before – which is particularly disappointing – but usually you’ll have changed something about it in a hopefully interesting way. Incidentally, I normally use ‘Save As . . .’ rather than ‘Save’, and give the new file a name which reminds me what I’ve done to it. This has the double advantage of helping me to achieve the same effect again by working out what I did to the file, and ensuring that I don’t lose an original which I might need again – either in its original form, or as the source for more experimentation. Some of these files that you end up with can be rather unstable and may sound different depending on which application you choose to play them back in. So my next piece of advice would be to try some different applications to audition the results of your work – Windows Media Player, Audacity, VLC, Quicktime, and so on. If you have a way of re-recording them as you play them, this would be good, as you can then save a stable file which will sound the same whenever you use it. The second example illustrates this. The first extract is the original sound file I used; the second extract is this file after processing in BBEdit Lite, played back using Videolan VLC; the third extract is exactly the same BBEdit Lite file played back using Apple Quicktime, producing a significantly different result. Both files were re-recorded to preserve these differences permanently, as described above. 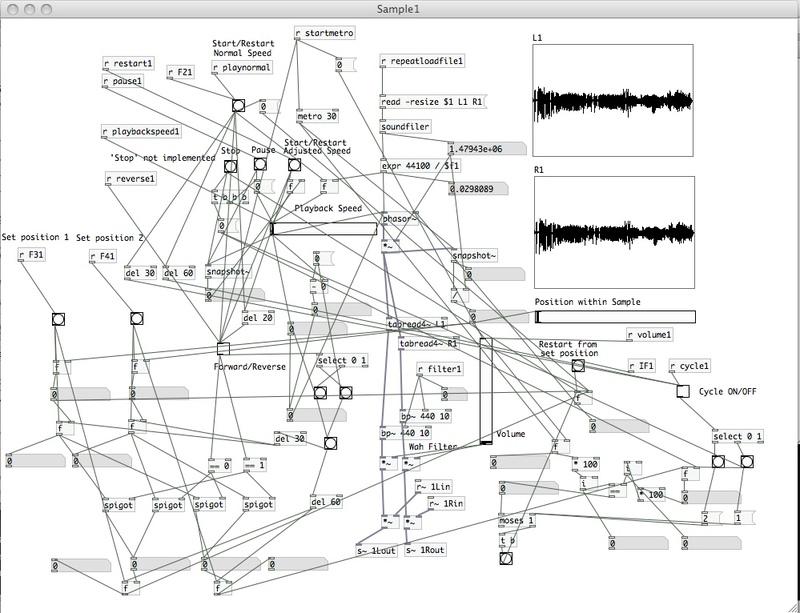 I use an excellent application called Wiretap Studio for this, but it isn’t freeware. 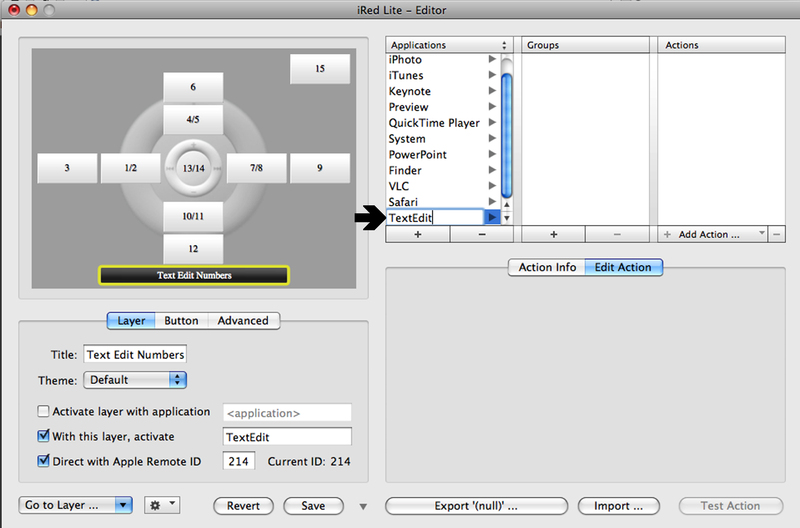 There are ways to do it without having to buy extra software – free applications like Soundflower (which I think only exists for Mac) or Jack will enable you to route the output of one application, which plays the sound file, to the input of another (like Audacity, for example), which records it. 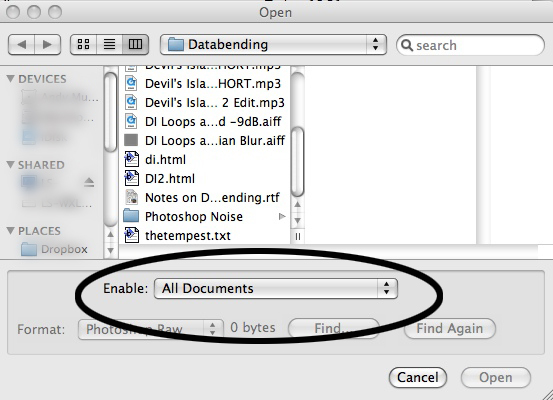 Another, less obvious, way to ‘bend’ sound file data is to open the file in a picture editor like Photoshop, apply an effect and save the file. This is slightly more complicated; I don’t know about other applications, but Photoshop won’t recognise sound files as pictures, so you have to do a couple of things to persuade the application to try opening it. First of all, make sure to choose ‘All Documents’ (as opposed to ‘All Readable Documents’) from the ‘Enable’ list. This makes all files, even sound files, potentially openable. If it doesn’t open and you get the dialogue box at the top of the following picture – which happened to me a lot – reduce the numbers indicated until you get the dialogue box at the bottom, then it will open. 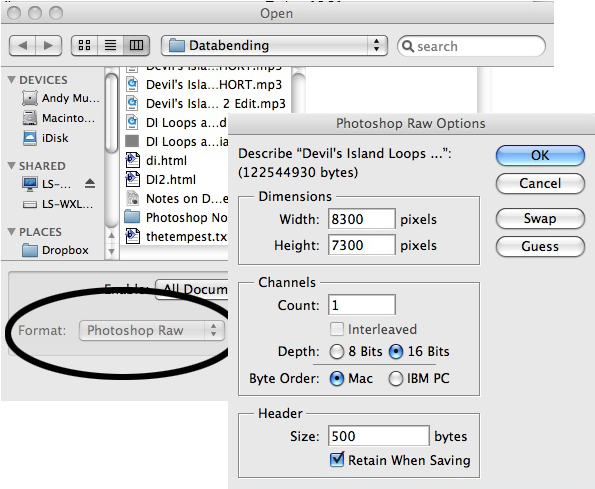 After that, you can apply some effects to the file, then save it. As mentioned above, I would keep the suffix – usually .aif or .mp3 – the same, but change the file name to reflect the process it had been subjected to. I had some success with Gaussian Blur, Noise and Despeckle, but any one of the many effects could do something to the sound. 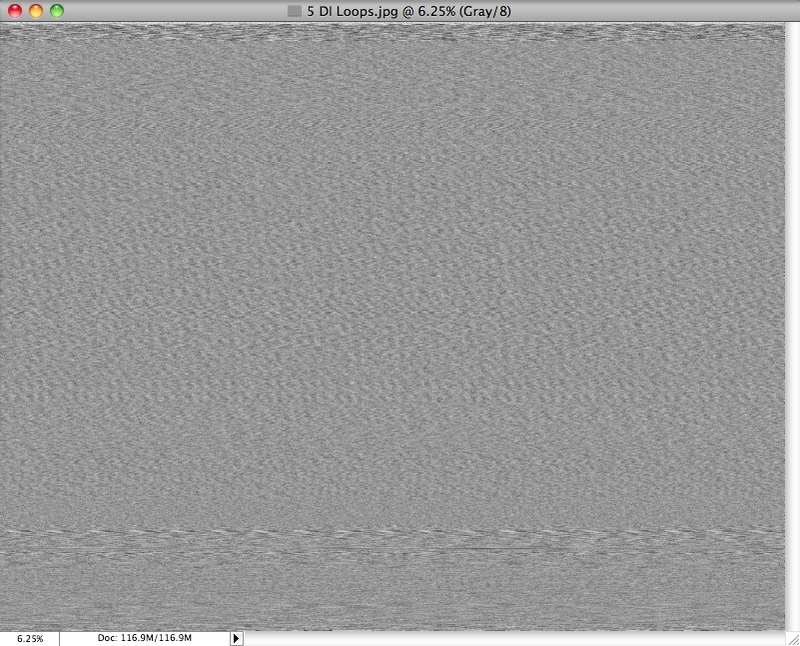 The first example here shows the original sound file; this file with a Gaussian Blur filter applied; then this file with a Despeckle filter applied. The second example shows an original .aif file with a Noise filter applied; and an original .mp3 file with a Noise filter applied, to show the different effect an identical filter may have on a sample which was identical in every way except the file format. 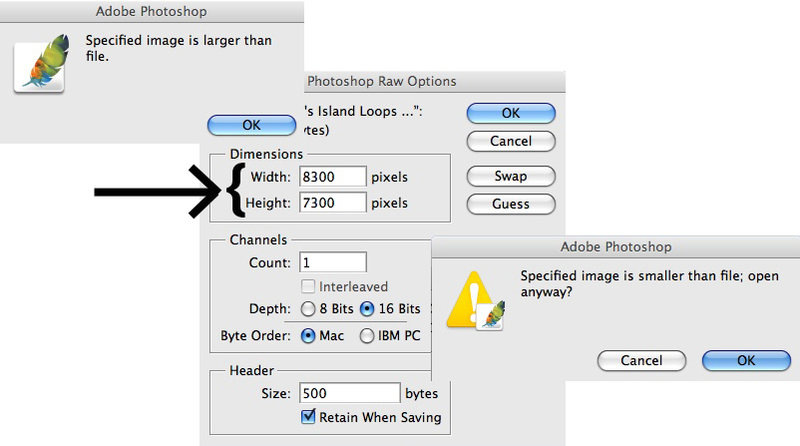 If you have problems opening a sound file saved by a graphics application such as Photoshop, the free Audacity can probably help. 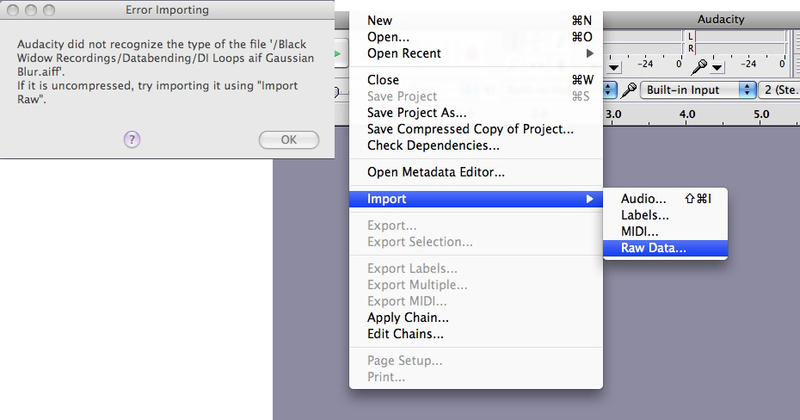 Even if you get the dialogue box shown at the top of the following picture, you can still use ‘Import’/’Raw Data…’ to open the file, and then save it in the format of your choice. Using the above methods you should be able to make some random, unpredictable and interesting changes to your sound files. I decided to write this post just to tie together some of my experiences of using game controllers of various sorts to make music. Since computers come with USB ports on them, it’s usually just a case of plug them in and get going. There are lots of them about and they can be picked up cheaply on eBay and Gumtree or from local charity shops. The main consideration is what program to use which can interpret the signals the controller is sending out and allow you to use those signals for your own purposes. There are many of these, ranging from simple apps to tweak the operation of a particular device, to large and complex programs designed to customise a device’s every action to the user’s requirements. This is made possible by the existence of the ‘HID’ standard for USB devices. HID = ‘Human Interface Device’, a description which can be used to cover devices such as computer keyboards, mice, game controllers, joysticks, and the like – all the things which humans use to interact with computers. As long as the device is made to conform to the standard – and manufacturers have readily got used to the idea of doing so – these programs can interpret the input and make it available to be changed to a different input; to perform an action completely unrelated to the device’s original purpose; or send data to another program which can use it creatively. 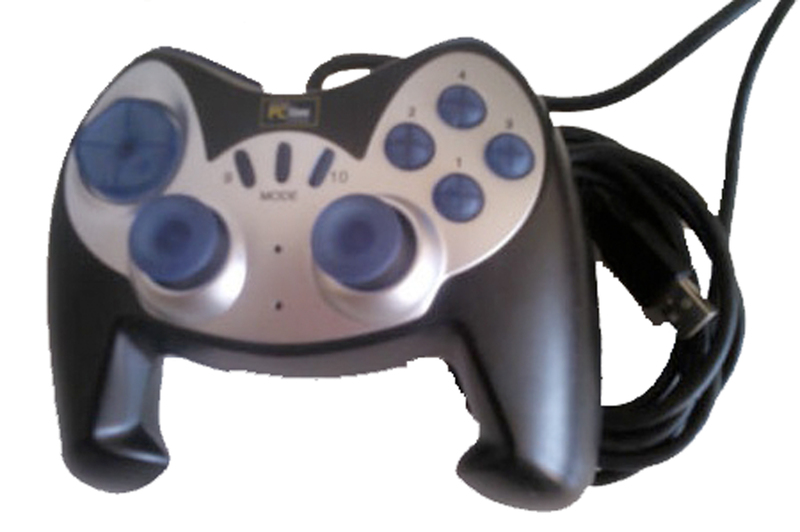 Multicontrol has the ability to interpret the game controller’s signals and pass them on in the form of MIDI messages, or OSC (Open Sound Control). 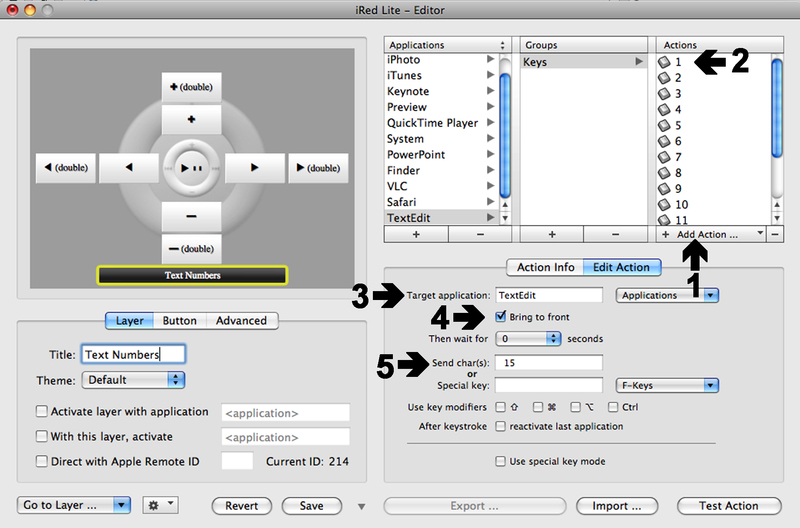 Designed by Alexander Refsum Jensenius, it’s distributed free for Mac OS. There is a source file downloadable from the site referenced above, although I have no idea if this can be compiled for Windows PC’s. The small drop-down list to the right indicates the wide variety of actions that can be incorporated into the instructions for each button or other control. The list in the left-hand column indicates a couple of devices which I’ve made customised groups of special controls for: once you’ve set the controls up, you can save them and call them up by name. It’s possible in this way to have several different set-ups for the same device, depending on what you want to use it for at different times. My favourite program is PureData, or Pd for short. 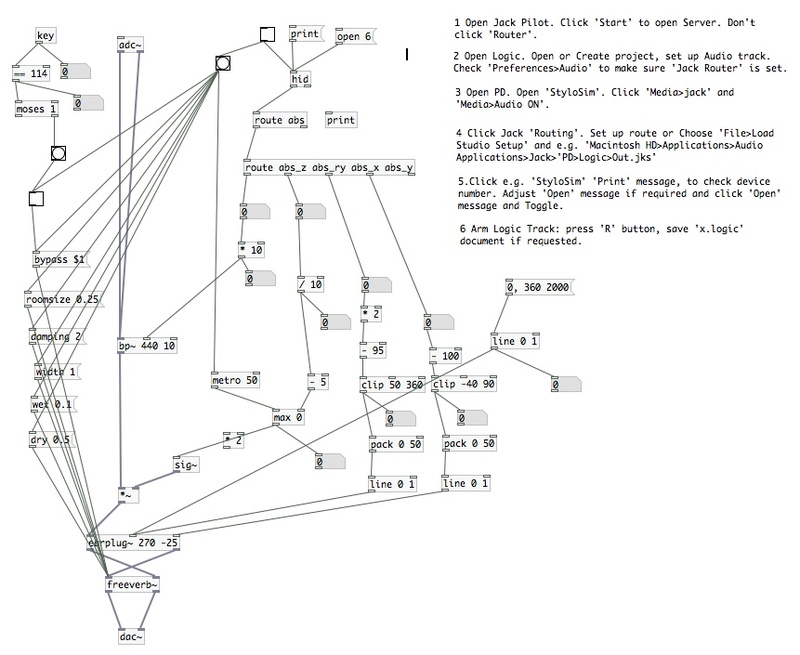 Using Pd means you have to write the programs yourself – but this is done graphically, rather in the manner of flow-charts, rather than by writing lines of code, and the program is specifically designed for making music, so it has typical audio and MIDI functions (Pd calls them ‘objects’) ready to use. I’ve used Pd both for creating instruments, like the Theresynth, which uses the PCLine Rumble Pad pictured above, and for sound and sample manipulation. The blog post for the Theresynth (which uses one of the joysticks on the controller for changing pitch in a way reminiscent of a theremin), also has quite a detailed description of the Pd programming. 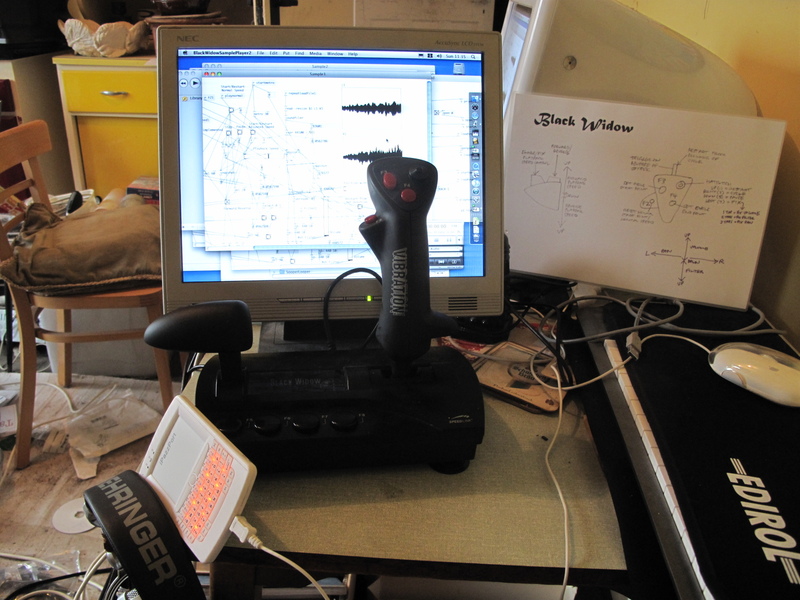 I’ve also blogged about various sound manipulation apps (or ‘patches’) in the past, including the StyloSim, which uses the joystick controller pictured above, and the Black Widow. 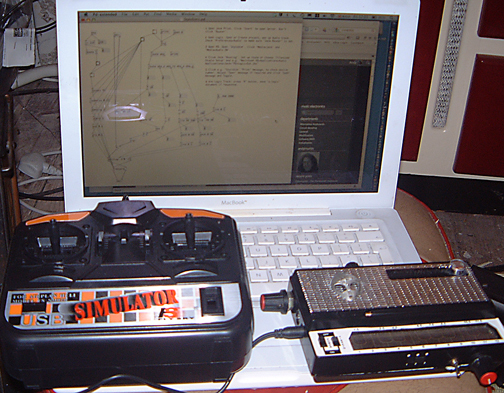 The small box with ‘hid’ in it, near the top right-hand corner, is the Pd object which recognises input in the HID standard; the ‘route’ objects below split up the different inputs, and then you can send them off to do whatever you need them to do – control oscillators or filters, perform mathematical functions, create MIDI messages, and so on. 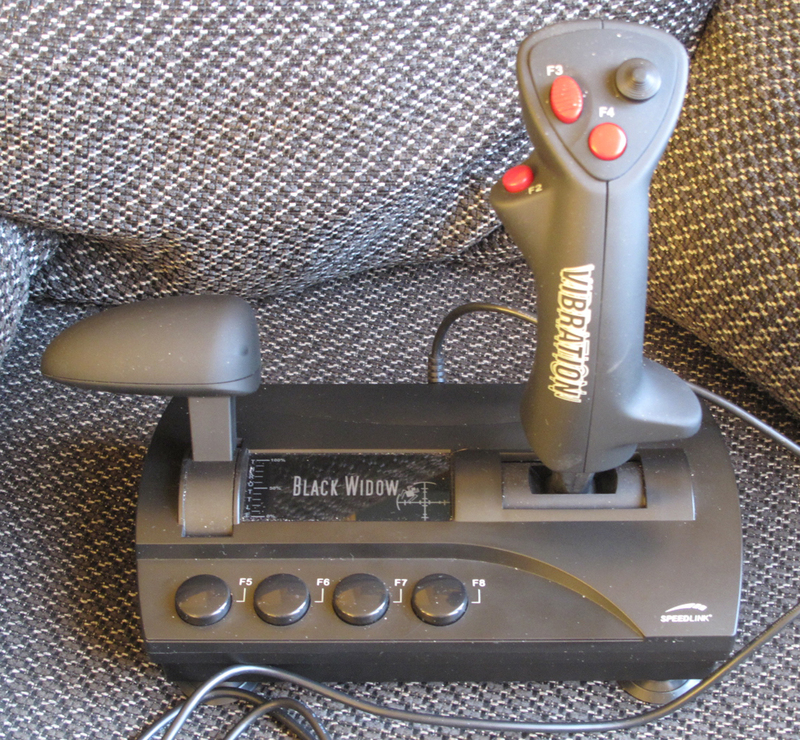 While on the subject of software, a handy piece of freeware which I often use is Joystick and Gamepad Tester from AlphaOmega Software. AlphaOmega produce a number of simple but ingenious apps which help you with your Mac, including an app which cuts out that annoying ‘chime’ when the computer opens (my car doesn’t sing at me when I turn the ignition, my hi-fi stays silent until I put in a CD, my TV remains mute until I select a channel – why on earth do computer manufacturers think we want to hear the machine start up! One of life’s unexplained mysteries . 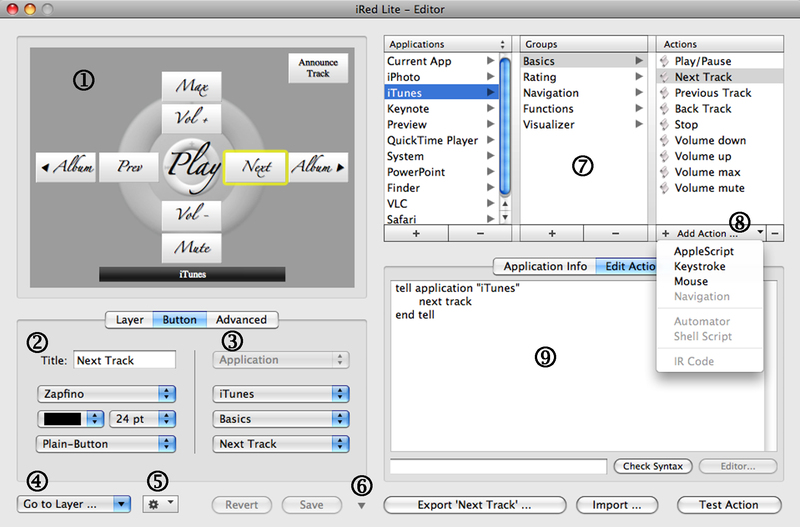 . .), but also some apps which can have a value in computer music. I may well have blogged about some others elsewhere. The purpose of Joystick and Gamepad Tester is to tell you what controls your USB device has, and if they are devices like joysticks, what are the minimum and maximum readings you can get from them: 0 – 127, 127 – 255, etc. 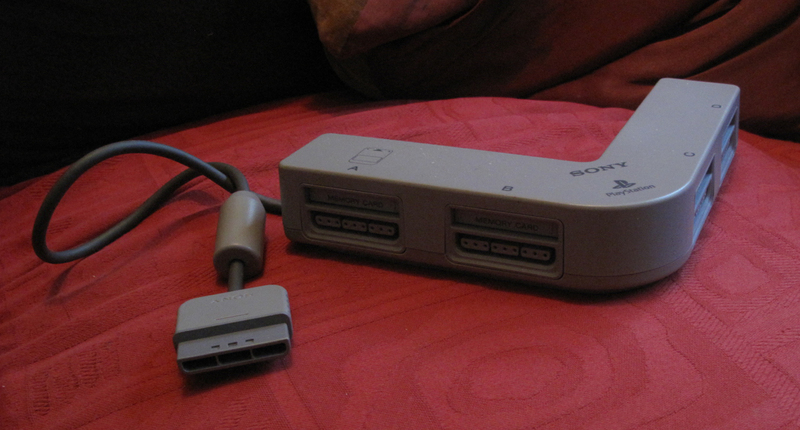 It looked as if it was originally part of a quiz game, and had a USB connector, so it looked as if it would be easy to use with the computer. I took it home, plugged it in and started up Joystick and Gamepad Tester. 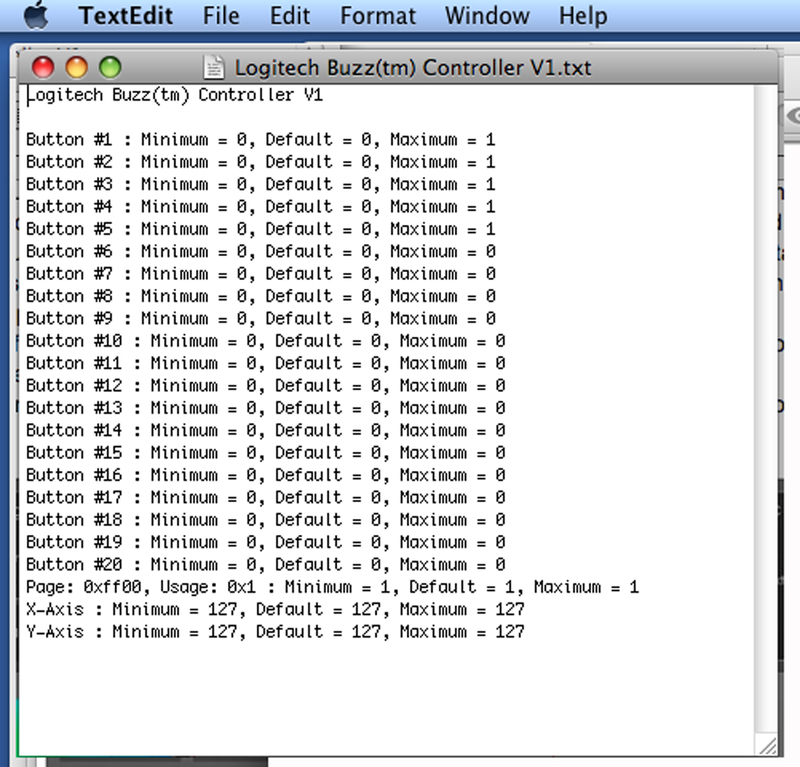 I found out first of all what the device was – a ‘Logitech Buzz Controller V1’ – and was able to select it from the drop down list. Note by the way that all the normal USB-connected devices are also listed: in my case, there’s the laptop keyboard, the infrared receiver on the front and the trackpad. The Apple IR Remote – listed in the screenshot above as ‘IR Receiver’ – isn’t exactly a game controller, and isn’t exactly an HID device like the others discussed here, but it’s worth a brief digression as its uses are very much the same. 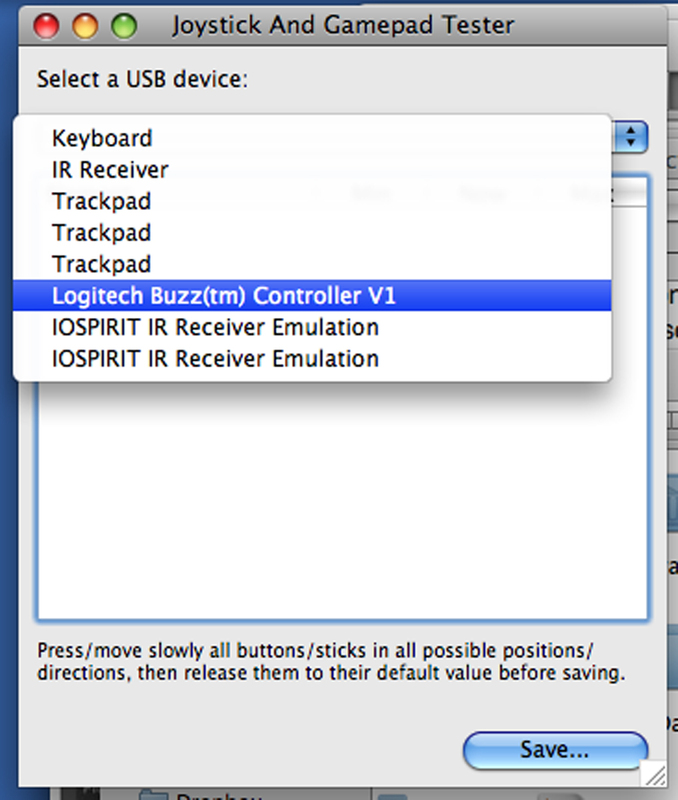 As far as Joystick and Gamepad Tester is concerned, nothing was listed when I selected ‘IR Receiver’ or registered when I pressed buttons on any of my Apple remotes – only when I selected one of the two entries ‘IOSPIRIT IR Receiver Emulation’. I don’t know why there are two entries, but they’re identical and are the result of installing either the app Remote Buddy, or its free driver Candelair – or very probably both – as I’ve been working on using Apple Remotes recently (see blogposts, starting here). 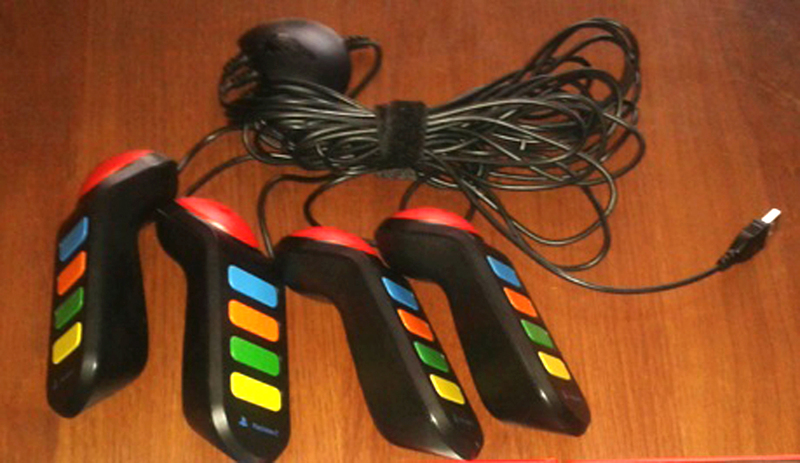 A useful feature of Joystick and Gamepad Tester in this respect was that it showed the remote’s individual ID No. in the ‘Now’ column. (The ID numbers in the ‘Min’ and ‘Max’ columns are irrelevant, as they will just show the highest and lowest Remote ID numbers used in the past). Just picking up a remote and pressing a button will change the now column to verify the number. 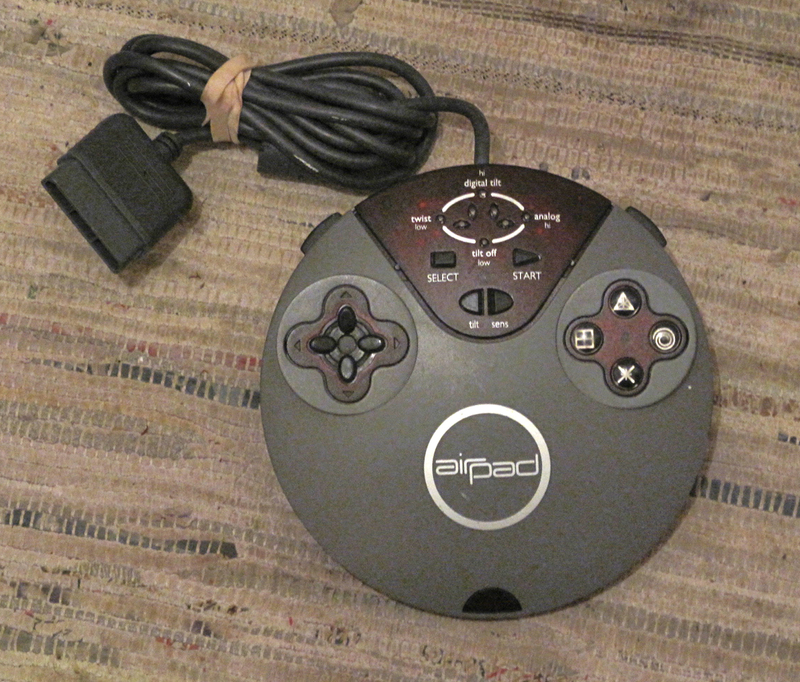 There are 5 buttons on each of the controls, and the list suggests that they are unique – that’s quite a decent number of buttons for a game controller, so that could be handy in some situations. Buttons usually show up with a minimum and maximum of ‘0’, so it was quite interesting see that 4 of them with a different reading in ‘Max’: perhaps these were the big red buttons, one on each handset? Actually, there weren’t: as you go round the buttons pressing them, you can see exactly which is which – the value appears in the ‘Now’ column: ‘1’ for pressed, ‘0’ for not pressed, which is typical for buttons, so by the time you’ve finished, they all have ‘0’ in the ‘Min’ column and ‘1’ in the ‘Max’ column. If you’re intending to modify the controller you’re testing by taking it out of its case and fixing new buttons to it, this is very useful because you can make a note at this point of which one is which. Better still, if you click the ‘Save’ button – indicated by the arrow on the screenshot above – you can save the list as a text file, print it out and make your notes on that. Then Joystick and Gamepad Tester confirms that the text file has been saved and it’s safe to quit or begin testing another device. I was impatient and clicked ‘Save’ before testing all the buttons, so the text file shows an incomplete test – I haven’t verified yet that each of the buttons gives a maximum ‘1’ when pressed and goes back to a minimum ‘0’ when released. I was intrigued by the two entries at the bottom for ‘X-Axis’ and ‘Y-Axis’. I studied the device carefully, and could find no control on it which resembled a joystick, which is what an entry like this would be for: data from these sources wouldn’t just be a ‘0’ or ‘1’, but a number moving from perhaps as low as -255 to +255. I’m assuming this indicated that the chip used in the device is capable of supporting a joystick, but this hasn’t been implemented. Perhaps, if one knew how, one could hack the PCB which controls the buttons and add this capability. There are two things worth mentioning about HID devices at this point. The first is that, provided you leave the USB output leads intact, you can remove the circuit board from the original case, solder your own buttons and potentiometers to it and it will still be recognised as the same device by the computer. This was the theory tested by the Cybersynth, which is basically a Theresynth, as described above, with the PCB removed from the Rumble Pad and put into a completely different case. 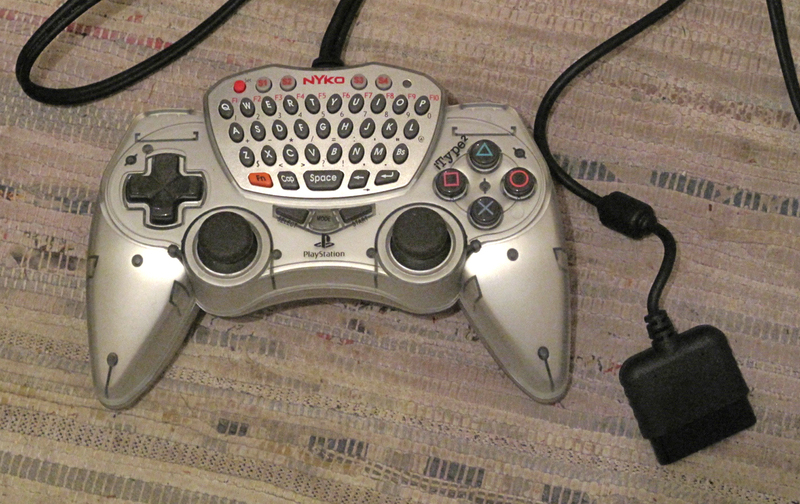 It doesn’t look like it any more, but the computer still thinks it’s a game controller. It was very cheap, having been scrapped as being broken, but what was wrong with it was nothing to do with the electronics. I took the board out, rewired it, and use it for controlling a looping program. You may be able to tell from this picture – although the scale isn’t particularly evident – that the PCB inside this particular brand of keyboard is ridiculously large. You could undoubtedly find a make with a much smaller board which would be more practical. As it happens, I’m using this particular board for an application which requires letters as an input, and no remapping – i.e. ‘A’ is ‘A’, ‘B’ is ‘B’ and so on. 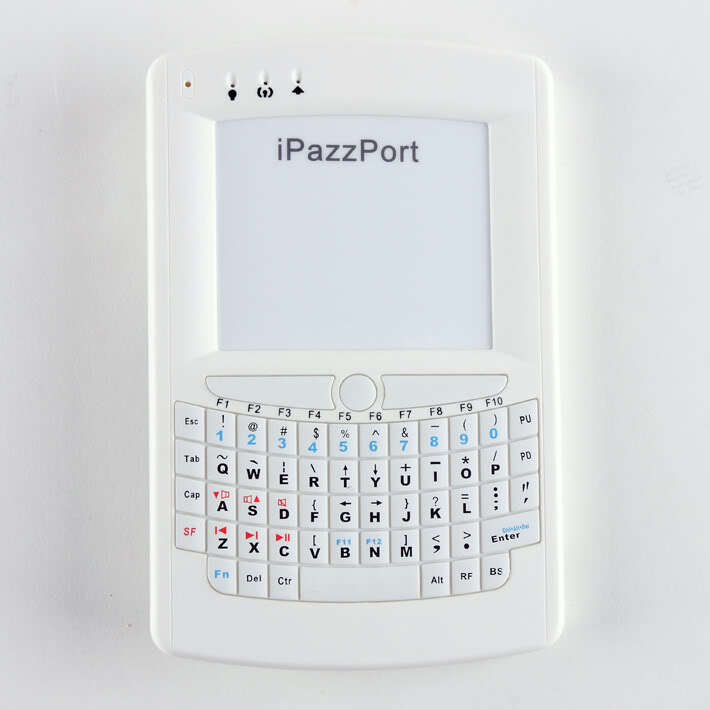 However, since the keyboard is an HID device, using one of the programs above, you could change the functions of the buttons and have a very large number of different control buttons available: the equivalent of 26 letters, 10 numbers, numerous punctuation keys; and programs will normally distinguish between lower and upper case letters, increasing the total number of controls even further. 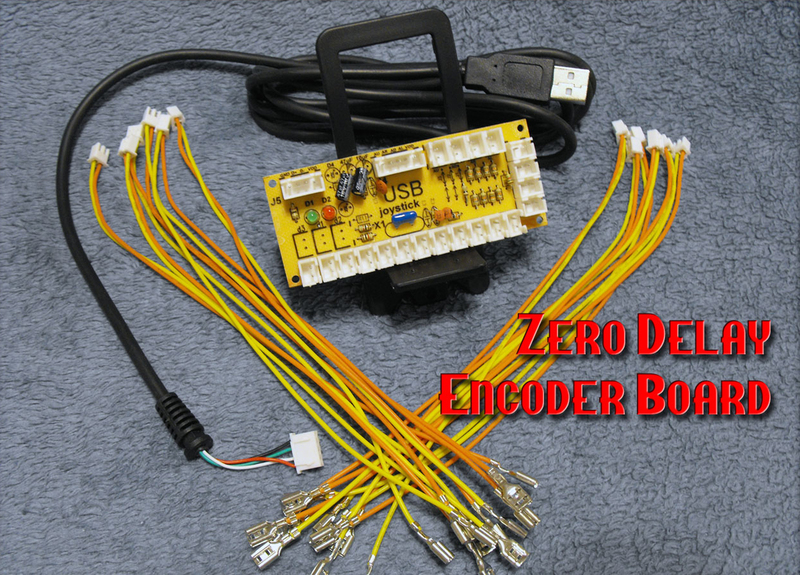 The second thing to mention is that there are many PCBs on the market with circuitry on them to output HID standard signals, and allowing you to attach your own combinations of buttons, switches, knobs and joysticks. People who make their own arcade games like them, so this is where you’re likely to come across them (on sites like this, for example). Using PS3 (wireless) controllers is also perfectly possible. There are drivers for Windows; later versions of Mac OS (from 10.6 upwards, I believe: see here for further details) have drivers built in, using Bluetooth. Earlier versions of the Mac OS can work with a driver from Tattiebogle. 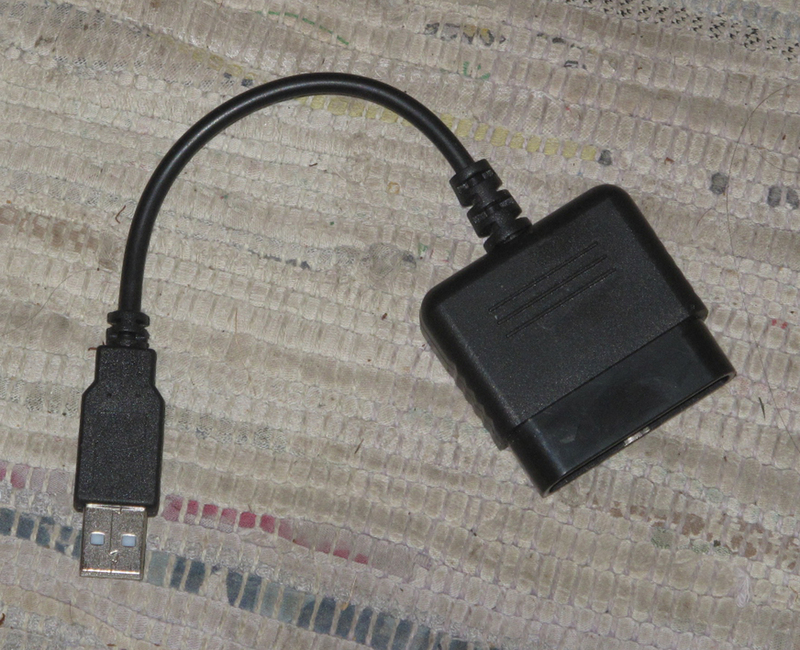 USB adapters also exist for XBox controllers, although replacing the proprietory connector with a USB plug doesn’t seem difficult, according to this illustrated article. 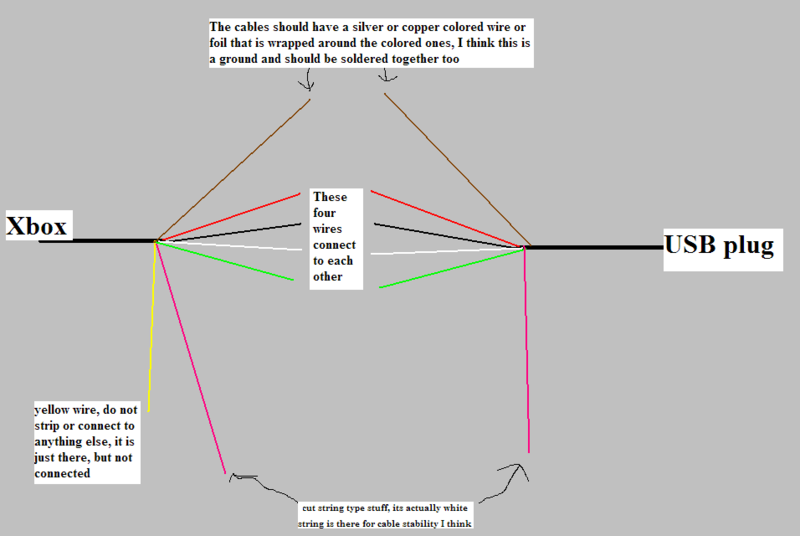 This implies that the Xbox cables have wires using the standard USB colour-coding, so if the wire attached to your USB plug uses these standard colours, they can simply be attached like-for-like]. Third-party receivers can cost as little as £5. At the time of writing, the most advanced consumer-oriented controllers are the Nintendo wii and Microsoft’s Kinect. The wiimote controller is a hand-held device which uses accelerometers and infrared to detect position and motion in addition to control by button-presses; Kinect uses infrared, cameras and microphone to detect spoken commands as well as hand and body positions from a distance. I’ll be looking at musical uses of these two systems in the next post in this series. 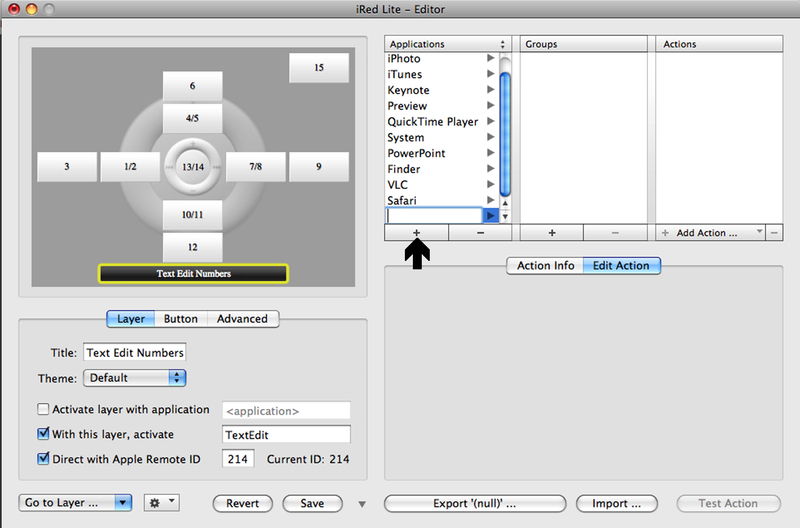 In the first part of this series of posts, I described the Apple infrared (IR) Remote system and some software which allows you to use the IR signals for controlling apps on the Mac. In this post I take a closer look at the Remote controller itself, and describe the way I modified mine. I must say that I’m not familiar with the silver aluminium remote, although I have no reason to believe it’s substantially different on the inside from the original white remote. This is the one I have experience of. 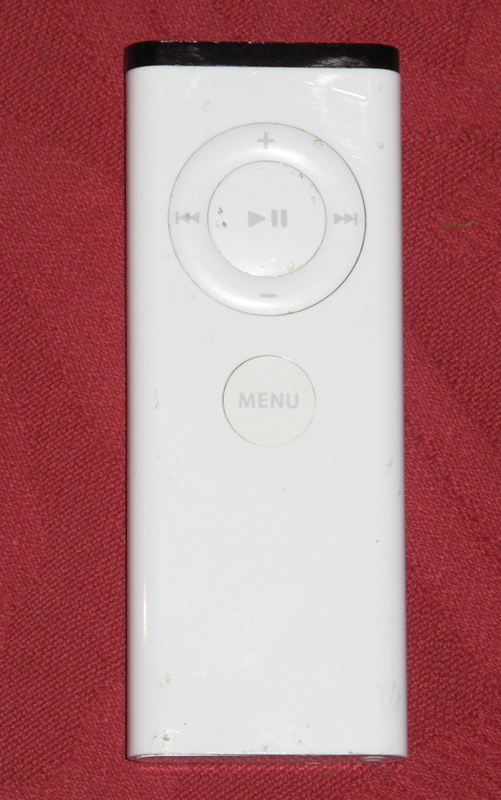 What’s good about the white remote is also what’s bad about it – it’s very tiny. This is great if you just want to tuck it away somewhere and not have a bulky TV/DVD player-type remote to lug about, but not so good from the point of view of it easily being overlooked or mislaid. So, one reason you might want to modify the remote is to make it larger and more suitable for the human hand. This certainly takes care of the problem of the unit itself being rather small, but to address the problem of the size of the buttons themselves and their awkward layout, the unit has to be taken apart. At the time of writing, you can still get hold of these white remotes on eBay for about £3, so if you want to try this, there’s no need to sacrifice the one that came with your Mac. The picture above shows the unit and the tool (or maybe one of the two tools) you need to open the remote unit. This is a small Philips or crosshead screwdriver. The next bit is the most difficult. 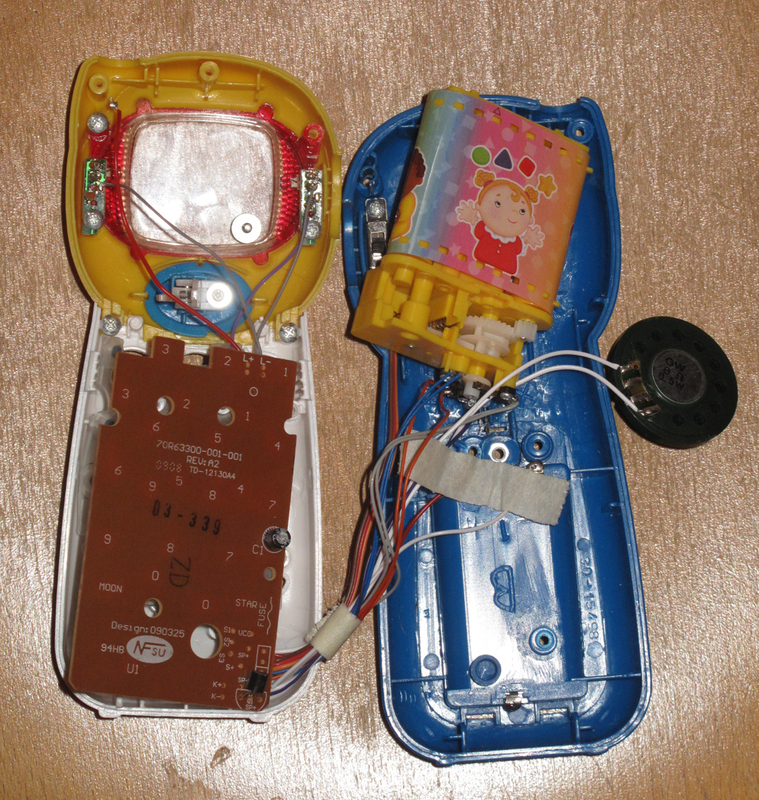 On the opposite side – the lower side in these pictures – is the spring which pushes the battery compartment out. The spring is firmly attached to the bottom of a small piece of plastic, and you have somehow to grab this piece of plastic and pull it out, with the spring on the bottom of it. If you look at the full-size version of the picture, you can see that the piece of plastic has tags on it, so I was able to poke the screwdriver under a tag and drag the plastic and spring out. You can then pull the battery compartment out. I did this with a pair of narrow pliers, gripping the white release button, which you can see in this photograph. Putting it back together, of course, is the reverse of this procedure. The trickiest part is undoubtedly getting the spring and its plastic top back in. This video by Andrew Williams, to which I’m greatly indebted: http://www.youtube.com/watch?v=vuP6CH770NM shows a remote being put back together, and explains the direction in which the tabs must face – front and back – for the plastic piece to go back in the correct position. You can see in the top part of the picture the infra-red LED and the 6 buttons. You can also see 4 screws which attach the circuit board the the plastic fitting. 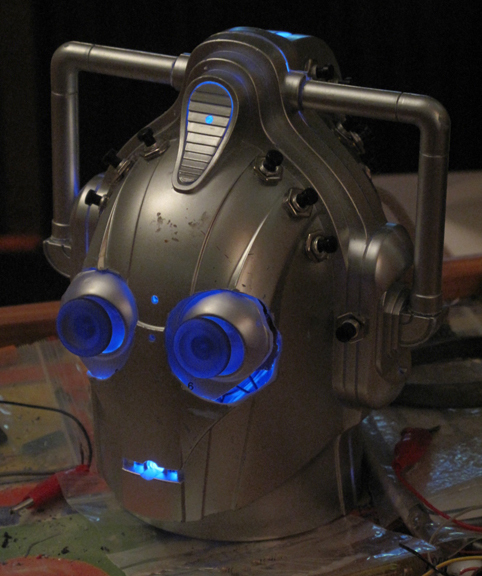 The first thing to do was take off the six silver ‘domes’ which make the contacts when the buttons are pressed, and see what connections they made. These are often, in my experience, attached together to a transparent sticky sheet which peels off, and so it was in this case. 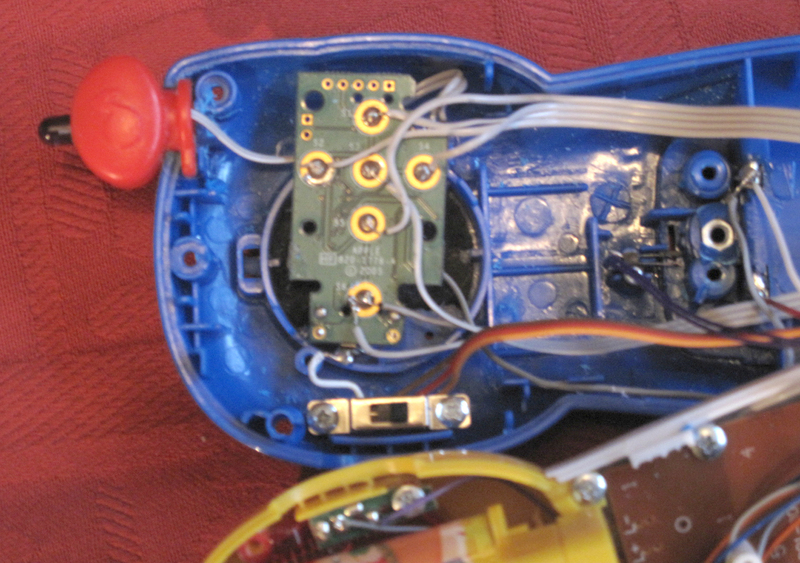 As you can see from this photograph – taken after I’d removed the four small screws holding the PCB to the plastic fitting – each button makes a contact between an outer ring and a centre spot. All the outer rings were connected together, to what looked like +V, while the six centre spots were separate. What I wanted to do was transplant the board into a larger unit, so I needed to solder seven wires to the board, and connect them to buttons in the new unit. 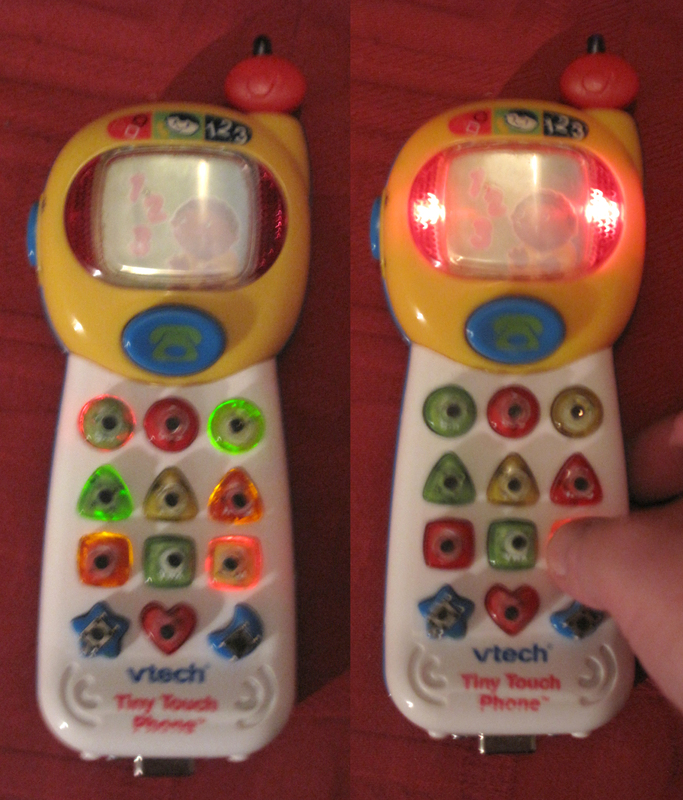 This is a vtech Tiny Touch Phone: it’s powered by two AA batteries – 3v, same as the Apple Remote; has 12 buttons – exactly twice as many as the Remote, which could be handy for dissociating short, long or double presses; and has flashing lights – which is always good. It also makes sounds, and under normal circumstances I would be looking to ‘bend’ these, but in this instance making noises wasn’t what the project was all about, so I decided I’d remove the sounds completely by taking out the speaker. 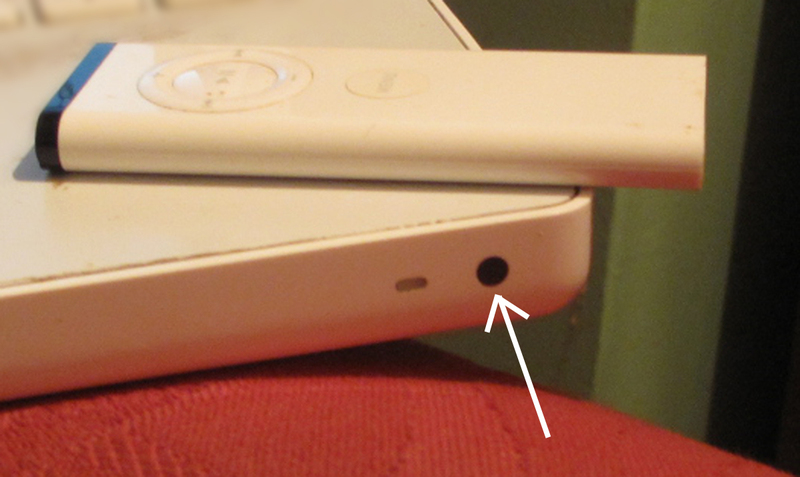 The Phone also has a hollow plastic ‘antenna’, which was perfectly placed for installing the IR LED. This is what it looked like inside. In this picture the large mechanical unit, which looks like the film sprockets in an old 35mm film camera is obscuring the speaker housing. With the speaker removed there looked as though there’d be plenty of room for the small Apple Remote PCB there. The wires for the LED could easily pass from there up into the antenna. The general idea would be to rewire the button connections on the Apple Remote PCB to the Tiny Touch Phone buttons. 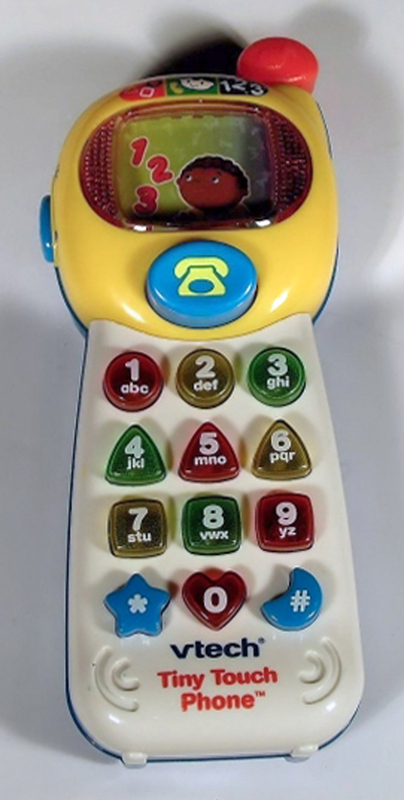 The Phone buttons (visible in the first picture above) are, however, hollow, and make connections with a membrane, rather like QWERTY keyboard, via their edges . I wanted to leave the membrane intact, to operate the flashing lights, so I decided to add small tactile switches with longish 3.5mm actuators which would be glued in the hollows with the actuators sticking out through a hole in the top of the Tiny Touch buttons. It was these switches which would actually operate the IR remote. Gluing these in without gluing them together so they wouldn’t function proved difficult. Letting superglue anywhere near them – even the gel type which I usually use – could prove fatal, as it has a habit of running everywhere. In the end I used epoxy, which is stickier and less runny, and tiny pieces of tissue paper soaked in epoxy to keep the switches in place. The moon and star buttons aren’t hollow, so I stuck tactile switches with short 1mm actuators to the top of them, on the outside, with wires running in through a small hole. In the end I only connected up the star: it would have been difficult to make the hole in exactly the right place in the moon and route the wires inside without disturbing the membrane too much. The star operates the ‘Menu’ button, which is less important than the others and doesn’t require more buttons to distinguish types of presses. In the event, all but one of the tactile switches worked after this treatment, which was OK, as there were two new buttons for each button on the original remote, so all functions would still be available. To modify the new unit, I first removed the speaker and replaced it with a resistor (two 22Ω resistors in parallel, actually, as I had these lying about. I didn’t have any 8Ω resistors to match the speaker, but 11Ω, I reasoned, was close enough). This created enough space in the top of the unit for the small Apple remote PCB. I reinstalled the buttons in their places and connected the tactile switches together. One side of each switch was connected to +3v, the other sides of the switches were connected together in pairs (except the moon, as explained above). This made 7 extra wires running down to the bottom of the unit. The presence of the wires might have an effect on the operation of the TouchPhone’s original buttons, but this wasn’t important as their only function now was to light up LEDs when the remote was operated, a feature which Apple neglected to provide in the original. As can be seen in the above picture, there was just about enough room for a 9-way D socket in the base of the unit. 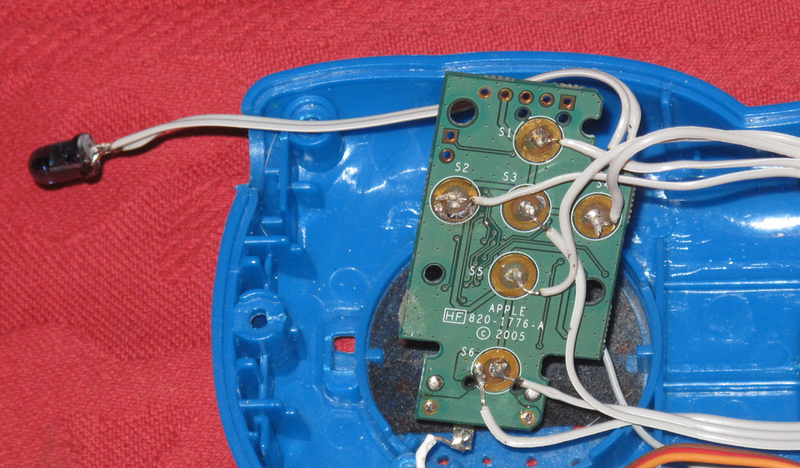 I put this in partly because it would allow for external operation of the 6 remote buttons – perhaps by means of a footswitch – and partly because it provided a handy link point between the tactile switches and the Apple remote PCB. To attach the remote PCB, wires were connected to the centres of the 6 switch points, and one of the outer rings, which were all connected together on the board. 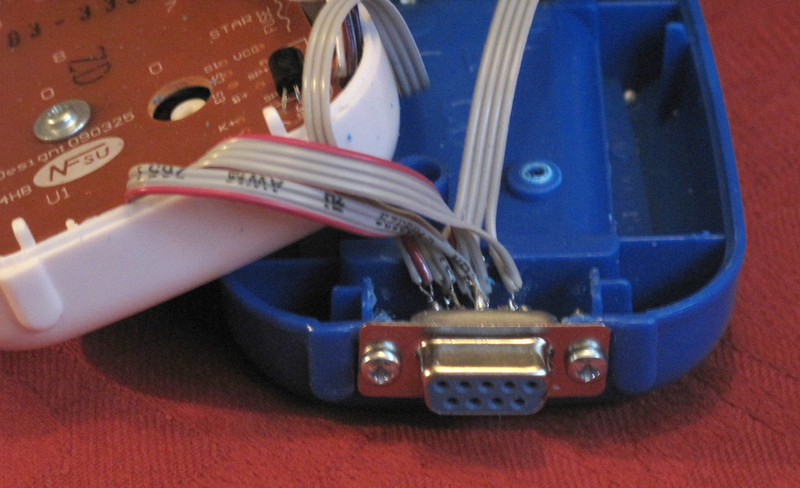 3v and 0v power cables were connected to the springy metal pieces which formerly connected to the coin-battery in the original remote housing. These connectors were shortened in order to fit the PCB neatly in the space where the speaker had been. At the same time I detached the infrared LED and put it on the end of a longer lead, so it would reach to the front of the unit when in operation. At this point everything was connected up, although not back in place, so I made a quick check, using iChat and the laptop camera in the way described before. I pressed all the buttons in turn, pointed the unit at the camera, and watched for the infrared LED to come on. When I was satisfied that it did so, I replaced the membrane and the TouchPhone PCB, as this would make pressing and testing the buttons a great deal easier. For the next step I needed a way of thoroughly testing if the remote worked as intended. I did this by creating a Tester program, using iRedLite. 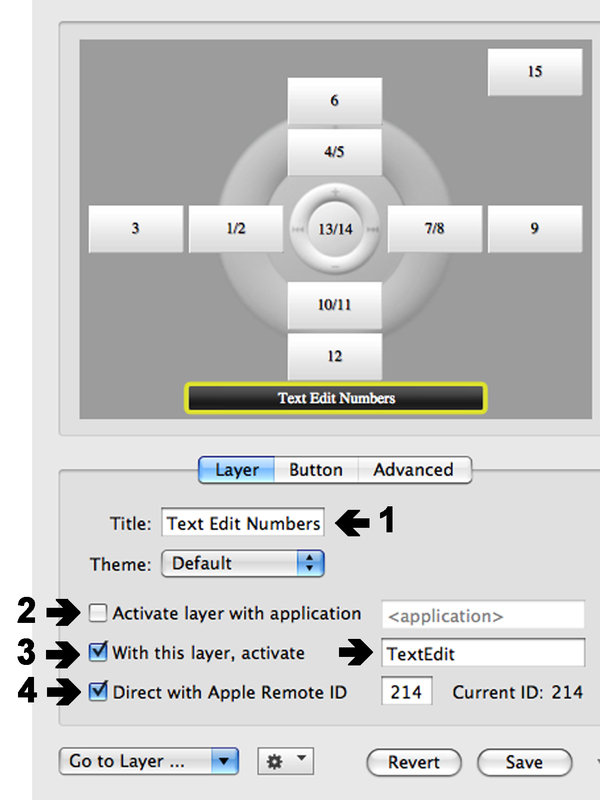 It takes quite a few steps to create a ‘Layer’ – a set of instructions for each remote button – in iRedLite, but this is how I created a ‘Remote Tester’. The ‘Menu’ button has special functions in iRedLite, but the other 5 buttons respond to short presses, long presses and double presses, so 15 separate instructions would be required. What I decided to do was use Text Edit, and simply have it print the numbers 1 – 15, according to which remote button was activated. I typed a name for my Layer into the ‘Title’ box, and then made choices about what would happen when the Layer was selected. I chose not to have the Layer activated when I switched to Text Edit, in case I wanted to type some text while using iRedLite with another application; but I did choose to have Text Edit activated when I switched to this Layer, because the actions all required text to be typed in it. I have several remotes, so to be certain which remote was being tested, I set it to respond only to a particular one: in this case, the one with the ID No. 214. 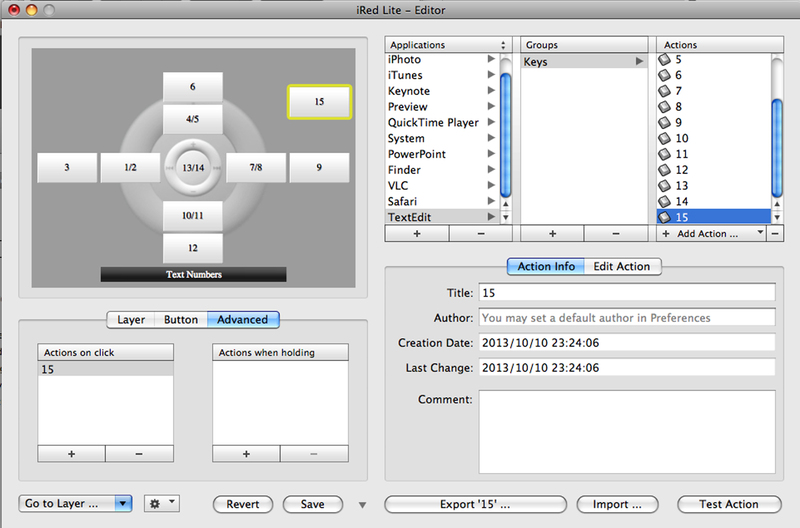 Having finished creating the Layer, I clicked on the small arrow in the bottom right-hand corner of the Editor window. I believe they call this the ‘Expert’ button, but it’s simply for accessing the section where actions are created and organised. Next you have to create a ‘Group’ – not for any special reason, I don’t think: it just works that way. If you create a lot of actions for one particular application, this allows you to put different types of actions together, i.e. Keystrokes in one Group, AppleScripts in another, and so on. I just wanted keystrokes, so I created a group called ‘Keys’. Group names are your personal choice. Once again, I clicked the ‘+’ sign under the ‘Groups’ column, and typed ‘Keys’ in the box which appeared. Then it was time to create some actions. Each action is entered individually, so I had to click on the ‘+’ sign at the bottom of the ‘Actions’ column 15 times, name the actions in the boxes which appeared, and specify what was to be done. Click the ‘+’ sign; name the action – again, this is entirely your choice: I just called them ‘1’ to ’15’; type the name of the application, or choose it if it appears in the drop-down list; check the box if you need the application to come to the front – which I did, because I wanted to read what it had printed; and type in what keystroke or keystrokes should be made. 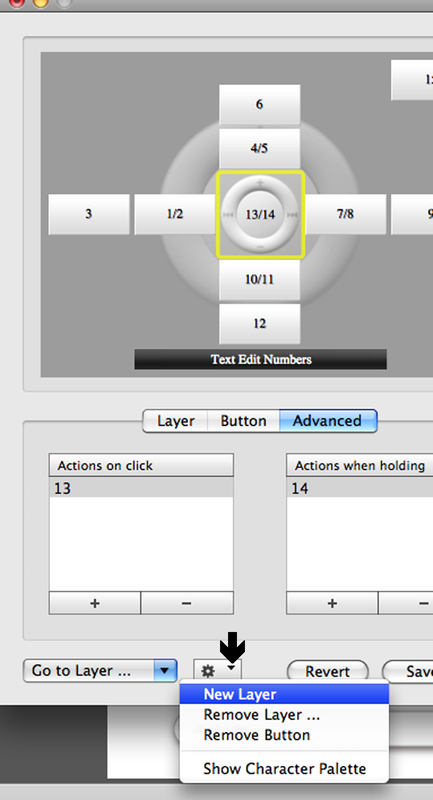 The button will be given the name of the action – in this case ‘1’, which is the name I had given to the first action, which was to print the number 1.
iRedLite shows the pattern of buttons in the way that it does to indicate that the button nearest the centre performs the short press action (which they call ‘Action on click’), while the button on the outside performs the double press action. In reality, of course, these actions are performed by pressing exactly the same button on the remote, but it makes it clearer to see which number of presses produces which action. So the ‘short press’ and the ‘double press’ are specified, but the ‘long press’ action (which they call ‘Action when holding’) remains to be allocated. I decided to add the long press action to the instructions for the inner buttons, so in the example below I selected the appropriate inner button (Action 4, the ‘+’ button on the remote) and the ‘Advanced’ tab. This allowed me to drag and drop the action I wanted to be performed as the long press action, printing the number ‘5’. I added a long press action to buttons 1 (the ‘Left’ button on the remote), 4 (the ‘+’ button), 7 (‘Right’), 10 (‘-‘) and 13 (the centre button) and renamed the buttons in iRedLite accordingly (‘1/2’, with ‘3’ being the double press action for that button on the remote; ‘4/5’, with ‘6’ as the double press, and so on). Note the button in the top right-hand corner, marked ’15’. There are 12 more places in the grey area of the button window where you can drag and drop actions, 6 on the left and 6 on the right. If you drag and drop an action somewhere in the grey space, a new button will be created there. This might come in handy if you had a modified control with differently positioned buttons. In this case, I used one of the spare places for the double press action associated with the centre button. Removing buttons, should this be necessary, is one of the functions on the drop-down menu where I chose ‘New Layer’ at the beginning. The numbers were all printed out in order, so the combinations of short press, long press and double press all worked as predicted – but the long presses produced a continuous stream of outputs, even though I tried to take my finger off the button as quickly as possible. The exception was the Centre button, which produced a single output of the number ’14’, no matter how long I held the button down. This behaviour might not be what you require if, instead of printing numbers, you want a single specific action to be performed. You might find the action repeated many times unless you’re able to take other steps to avoid this. 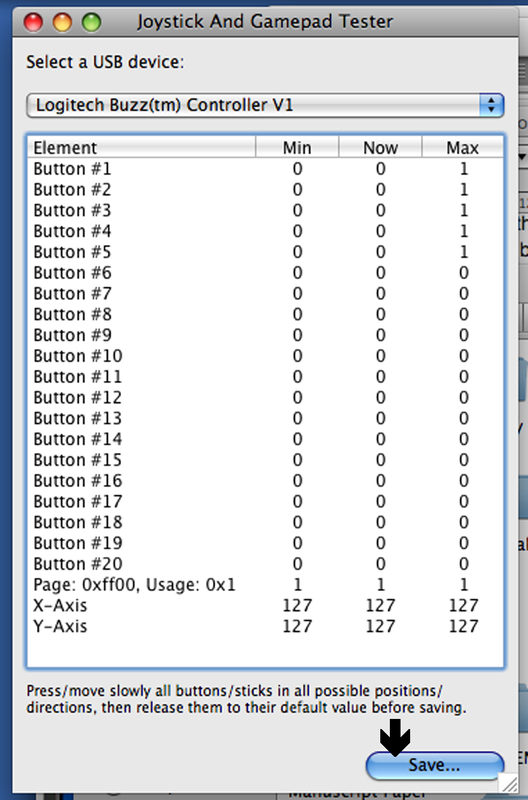 However, for testing purposes, this was fine, and I had established that the remote should, with iRedLite, be able to distinguish between 15 separate actions, despite only having 6 buttons. 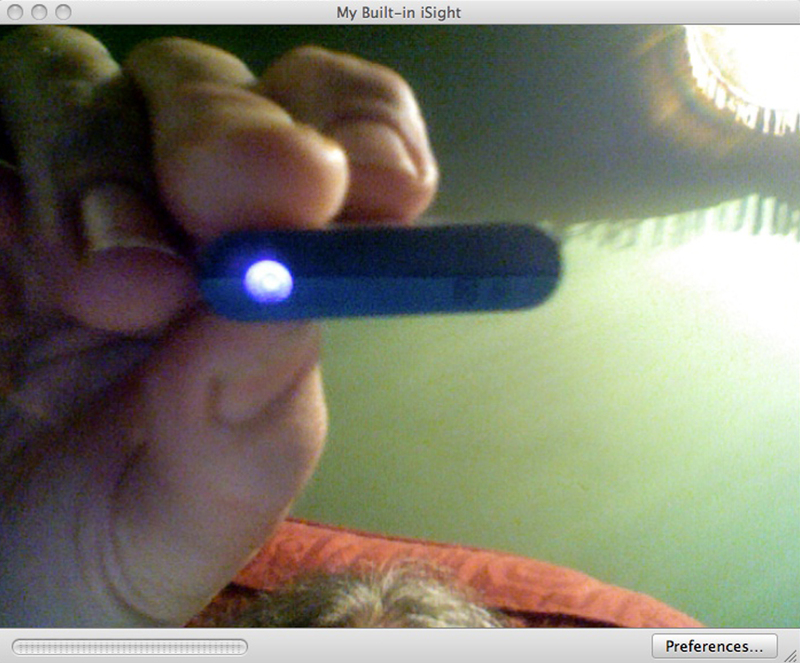 The final stage of the project was to try out the new Tiny Touch Apple IR Remote to see if it would function correctly, using the iRedLite TextEdit Tester. I quickly opened Joystick and Gamepad Tester to check the ID number of the new remote, which was 211. 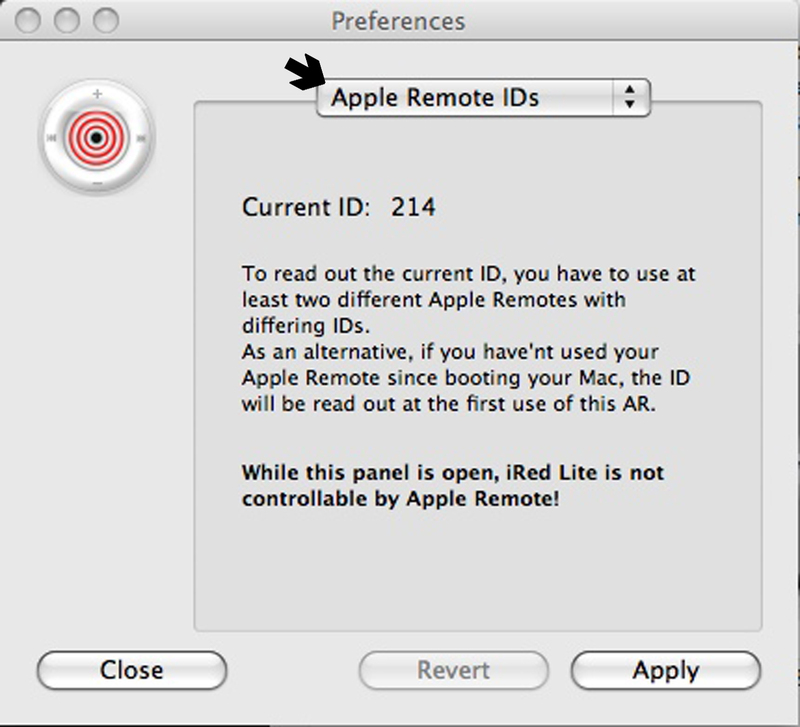 I then opened iRedLite, went to the correct Layer for my Tester, and changed the remote number to which it would respond from 214 – the remote I had originally use to create the Layer – to 211. The TouchPhone has a Power switch, but in fact the IR Remote worked even when it was in the ‘off’ position; in the ‘on’ position it worked with added lights. As before, I pressed each button in turn with a short press, a long press and a double press, checking to see that the correct numbers were printed in Text Edit. and wrote the ID number on the back. Now I had the world’s most colourful Apple IR remote! It could have been the world’s noisiest, had I not removed the speaker, but I felt this would be gilding the lily – and would probably have been a distraction, given that I had conceived of the remote as being part of a sound-modifying system, not a sound-producing system. I was a little upset as, just as I was putting it back together, I broke the plastic link behind the ‘telephone’ button that mechanically ‘winds the film’ and changes the picture on the screen. However, this only deprived me of more ways of turning LEDs on, and didn’t in any way affect the IR controls, so ultimately I was satisfied with my achievement. I didn’t want to spend more time on it at this stage as I wanted to move onto the next part of the IR project. For this, see Part 3: Additions. [Edit: I’ve since managed to get hold of another Tiny Touch Phone and replace the broken film winder, although I haven’t yet had time to change the tactile switch that got glued together]. 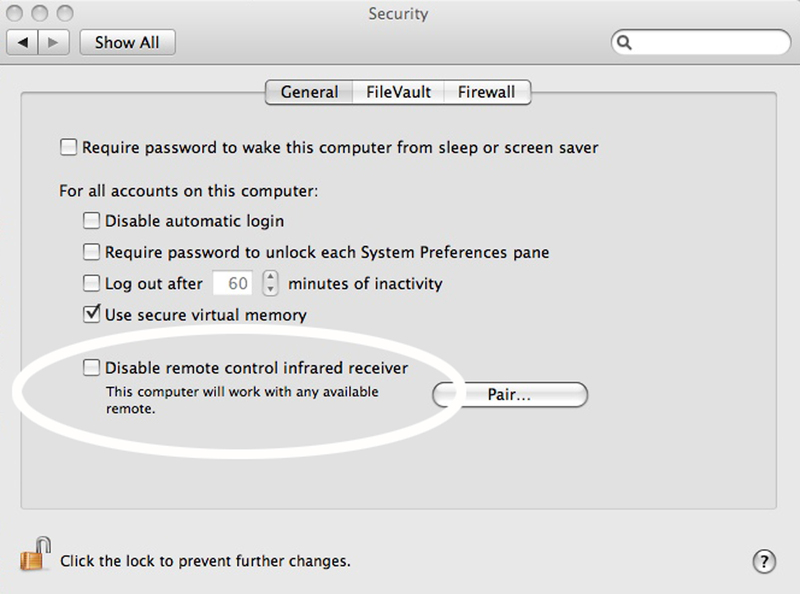 This article, by and large, is for Mac owners, as it describes the Apple infra-red (IR) remote control system that’s been used on and off in Apple machines for about 7 or 8 years. There is an article here which describes the remote being used on a Windows PC, and here on a Mac running Windows, but I imagine these are not common usages for this system. In fact, I don’t believe the Apple IR system is well known at all amongst Mac users, and I hope this study will show that it can be more useful to music makers than was previously thought. It’s not clear from the picture, but if you haven’t seen one, it’s quite tiny – about 8cm by 3cm. I’ll be returning to that point in Part 2. The IR system began with the iMac G5 and quickly spread to the white Macbook, Macbook Pro and Mac Mini. 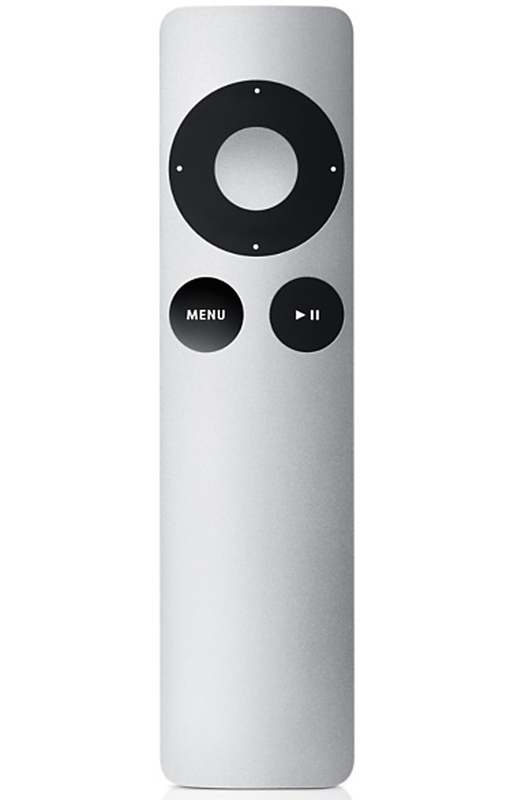 A slightly larger silver aluminium version of the remote came out in 2009, but also in that year Macbooks stopped being made with IR capability. It remained as an option on the Macbook Pro, but the remote itself wasn’t being bundled with the laptop. This is the silver remote. 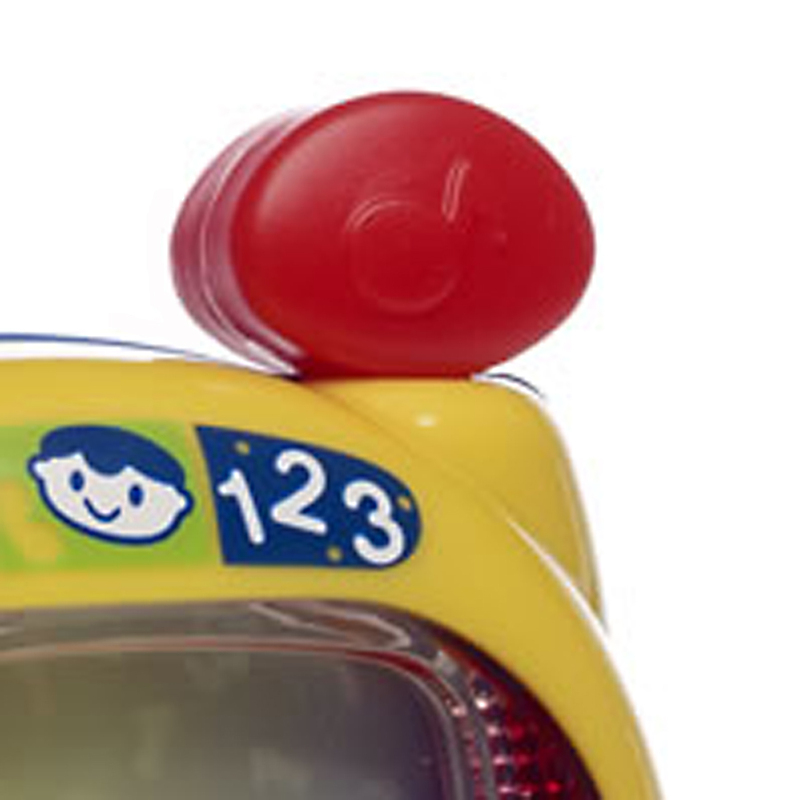 Note that the ‘Play’ button has been moved from inside the ‘+’, ‘-‘, ‘Left’ and ‘Right’ buttons, and placed separately, to the right of the ‘Menu’ button. then it’s got IR built in. The one area where the control seems to have remained popular is with the Apple TV/Home Theatre users. There was an application called Front Row, which used the remote to control films and music, but I don’t believe this has been in use since OS 10.7. All of this is a shame, as the ability to control your computer wirelessly can often come in handy, and several companies produce excellent software which greatly expands the ability of the Apple remote to control pretty well any application in any way you want. Of course, if you have a Mac, then you very likely have the luxury of Bluetooth as well, and I have blogged, or will be blogging, about various uses of Bluetooth. 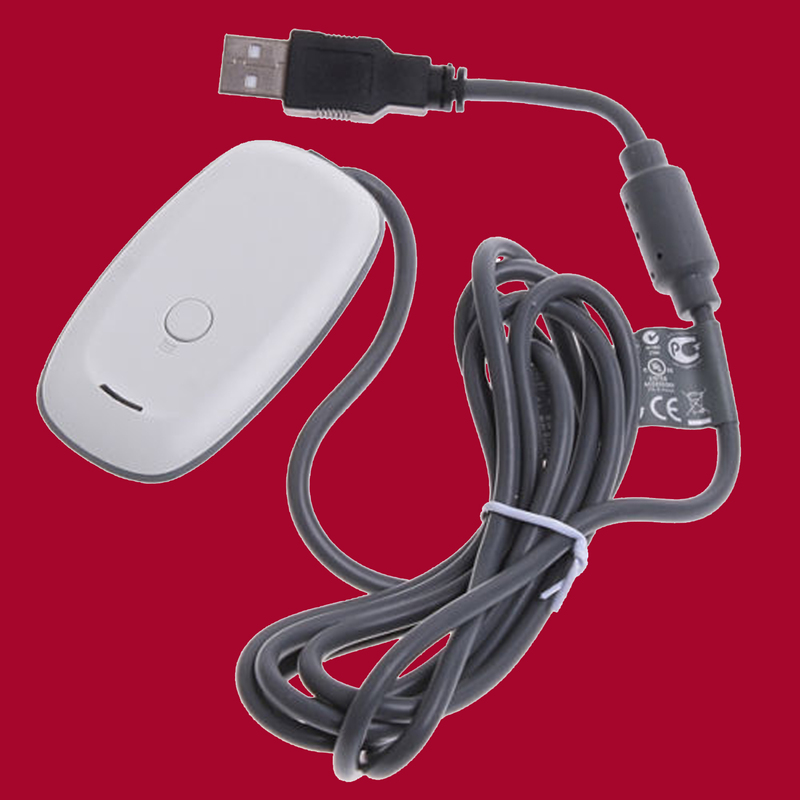 However, it could be that your Bluetooth system is fully occupied with, say, your wii controller, and this extra way of passing information to your computer becomes a vital necessity. Although most of the following is based on my experience with my MacBook, which has IR built in, I’ll be speaking about things one might do to add IR capability to a non-IR Mac. There are three things to do to make sure your IR remote is potentially going to work. The first is to ensure that the battery is OK; the second is to confirm that the infra-red LED is lighting up; and the third is to make sure the computer’s IR capability is turned on. The remotes are powered by a CR2032 coin battery. Apple designers, as we know, live in a world where bent paperclips are always to hand, so with the white remote – like the method of ejecting stuck CDs – there’s an indentation in the bottom of the case which can be poked with a bent paperclip to eject the battery tray. In this case it isn’t inside a small hole, so a pen, pencil, or a 3.5mm headphone plug will also work perfectly well. 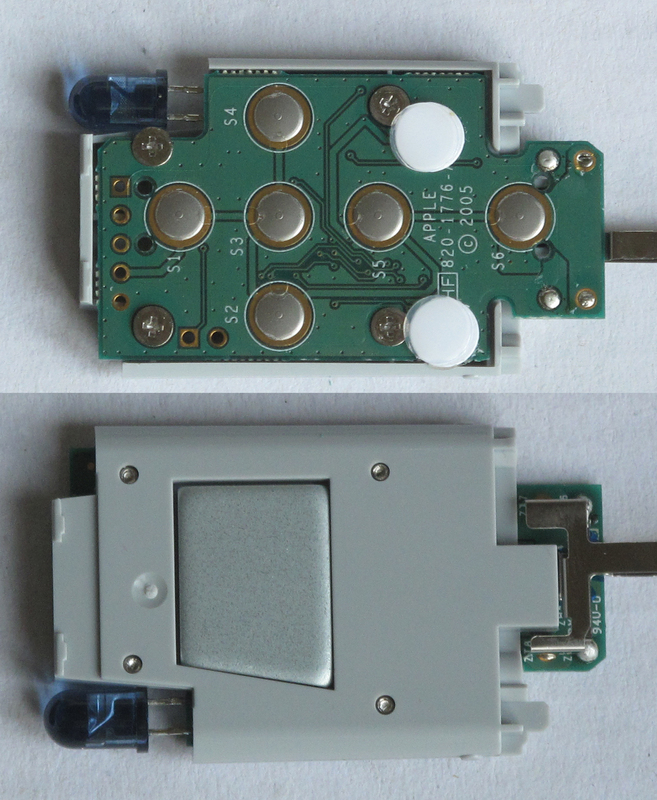 As illustrated, the silver remote has a different method: a battery compartment which is opened by twisting a small coin in it. As for checking that the remote is functioning, the essential problem with this is that the light it gives off is infra-red, and therefore you can’t actually see it. then the unit is working. Make sure the box isn’t checked and it says ‘The computer will work with any available remote’. will enable you to do that (provided you’re logged in as an Administrator). The remote and the computer are now paired; the ‘Pair’ button changes to an ‘Unpair’ button, and the text now says ‘This computer will work with only the paired remote’. 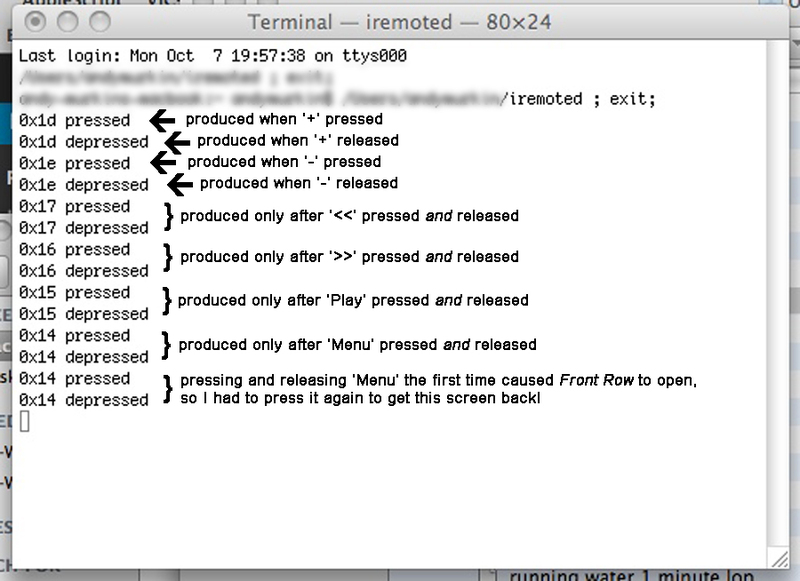 Using the remote itself, you can unpair it by pressing ‘Menu and ‘Left’ at the same time, for about 5 seconds. According to Apple, the remote works up to 9 meters (30 feet) from the receiver. 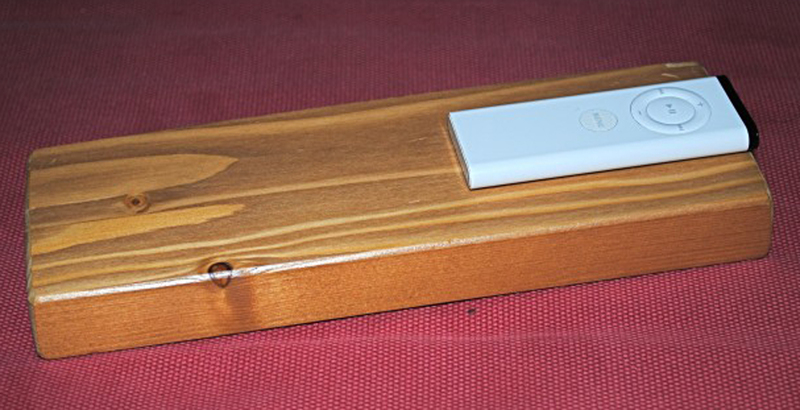 Unlike Bluetooth, of course, we’re talking about light here, so there can’t be anything in between the remote and the receiver that would block the signal – although you might be lucky and able to bounce the signal off a wall on on its way to the receiver. So, now the remote is working, what can you do? The answer is, not a lot. You can use Front Row to watch films or listen to music, unless you have a modern operating system, 10.7 or later; you can remotely control iTunes, or you can make your computer go to sleep and wake up. Not very practical for making music, which is, after all, what this blog is about. [Edit: since writing the above, I’ve installed OS 10.6 and a newer version of the program VLC, from Videolan, an excellent free audio, but predominantly video, file player. Some of VLC’s functions can be controlled with the Apple Remote, which is handy. 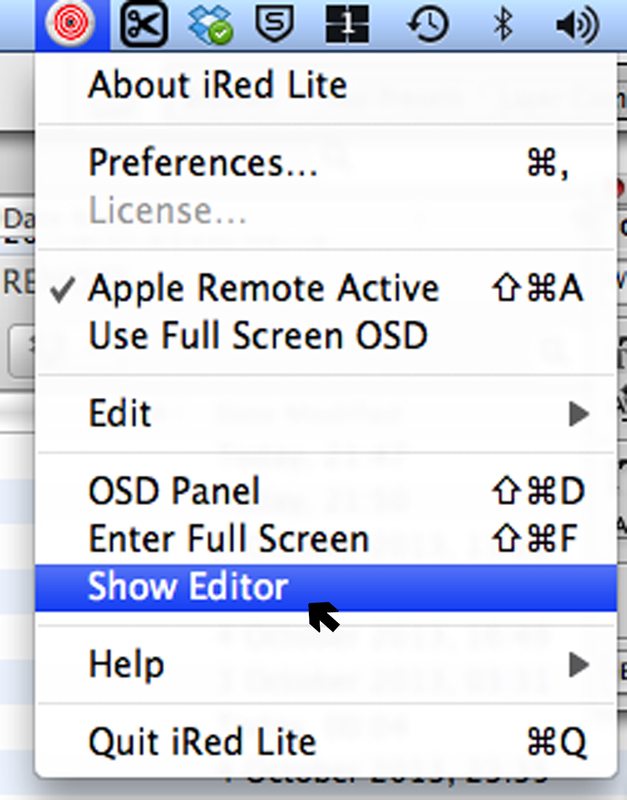 I don’t know if this can be done with earlier versions of Mac OS]. So, an important part of making the remote work would be to find some suitable software to interpret the input. The first thing I looked into when I got my remote out of the cupboard and got it working was whether it would work with PureData (Pd). Many types of HID (Human Interface Device) will act as musical instruments or effects devices – as I have described in the blog before – and so can the Apple IR Remote, although only to a limited extent. So unfortunately Pd was only able to recognise two of the buttons on the IR Remote, ‘+’ and ‘-‘. This was of limited value, so I needed to see if there was any software which could expand the usefulness of the device. Luckily, there was. There are several programs, in fact, which can greatly extend the range of control the Remote can give you. Nowadays, in fact, Andreas seems to be concentrating on the amazing Leap Motion Controller, which is going to deserve its own blog page one of these days. I wasn’t able to test out the BetterTouch Tool: it’s free, so there’d be no problem for you downloading it (from here, for example) and trying it out, but only supports OS 10.7. There might be a legacy version still available for 10.6, but I couldn’t find one for 10.5, which I’m still using. Mira is a dedicated Apple Remote app which, when installed, is controlled from System Preferences. 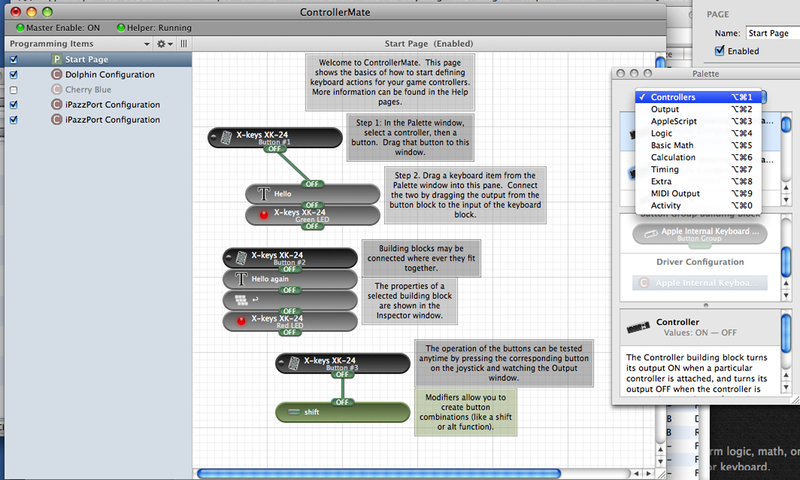 The opening view shows the remote buttons in the centre: you click on each button to assign a function to it, which may be a keystroke, system action, or instruction open a program (including AppleScripts). Mira supports short presses and long presses, effectively doubling the number of actions available from the 6 buttons, and provides a number of combinations of short press/long press combinations. A comprehensive Help menu is available by clicking the ‘?’ button in the bottom right-hand corner of the Mira window. Mira is available from Twisted Melon in versions for OS 10.4+ and 10.5+. Also available, for the deprived Mac with no IR receiver, they offer the Manta TR1 plug-in USB IR receiver. At the time of writing Mira costs $15.95 (Canadian) for single licence and $29.99 for 3 licences; the Manta TR1 costs $19.99; and a bundle of 1 Mira licence and a Manta costs $29.99. Remote Buddy looked particularly promising as it also offered control of wide array of remotes, not just the Apple remote, but other makes from the likes of Griffin and Sony, iPhone and iPod Touch, and even Nintendo wiimotes. OS 10.4.6 and above are supported. Remote Buddy also installed its driver, Candelair (also available as a free stand-alone). Configuring the remote’s buttons consists of specifying an application – although ‘Default’ and ‘Virtual Remote’ options are available – and defining a group of actions called ‘behaviours’. 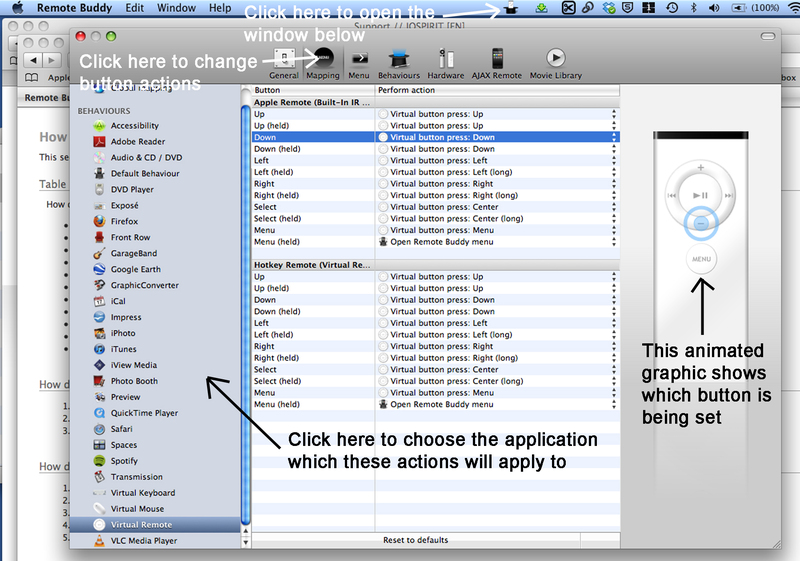 There are appropriate suggestions for each application, and you can create your own Custom actions. Like Mira, Remote Buddy supports short and long button presses and allows the same kinds of action choices; Help is available from the Remote Buddy menu. It costs €19.99. However, I wasn’t able to use these with the [Route] object, as one normally would. Undoubtedly, the be-all-and-end-all of infrared applications is iRed. Designed to work with the iTrans infrared module – which transmits as well as receives – this system can, in a nutshell, allow you to control your computer with any infrared control and allow your computer to control any device with an infrared receiver. Possibly slightly extravagant for present purposes – and it doesn’t work with the standard Apple IR receiver, of course (which doesn’t transmit). However, iRed Lite is much more the sort of thing I’m considering here. In fact, for several reasons, this is the one I chose to use, partly because it’s free, partly because I liked the flexible onscreen display window, partly because it recognises short presses, long presses and double presses. 1. This panel replicates the Onscreen Display. The buttons are laid out here in the same format as the buttons on the remote. The ‘extra’ button at the end of each row is for the ‘double-click’ action. 2. This section, when the ‘Button’ tab is selected, allows for changing the style of the buttons. 3. In this section the action performed by the button can be changed. 4. This drop-down menu, as the name suggests, allows the settings for different Layers to be displayed. A Layer is a collection of actions, usually applying to the same application. 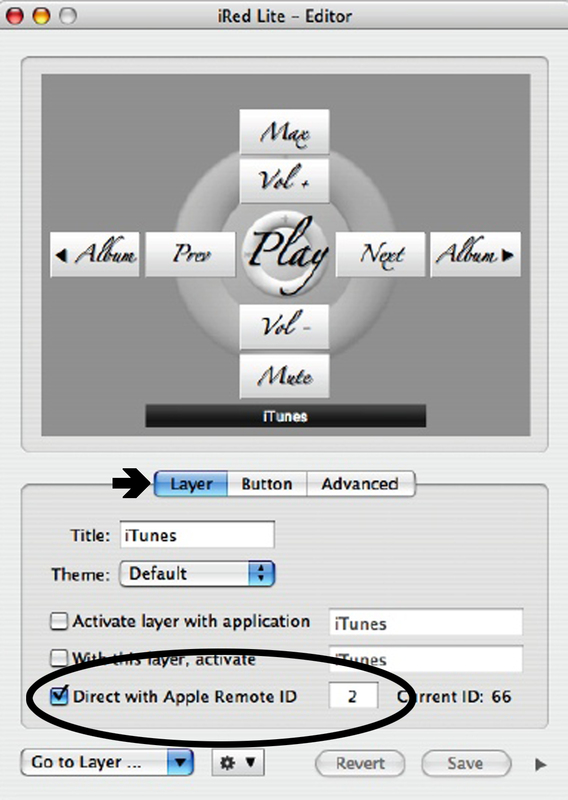 When a Layer is active, the actions described in that layer are the ones which will be performed when the remote buttons are pressed. 5. This drop-down menu gives access to more functions, such as remove selected button, create or remove a Layer and open the Character Palette for access to special characters and symbols. 6. Clicking this arrow reveals or hides the sections on the right-hand side of the picture in which more complex actions can be specified. 7. 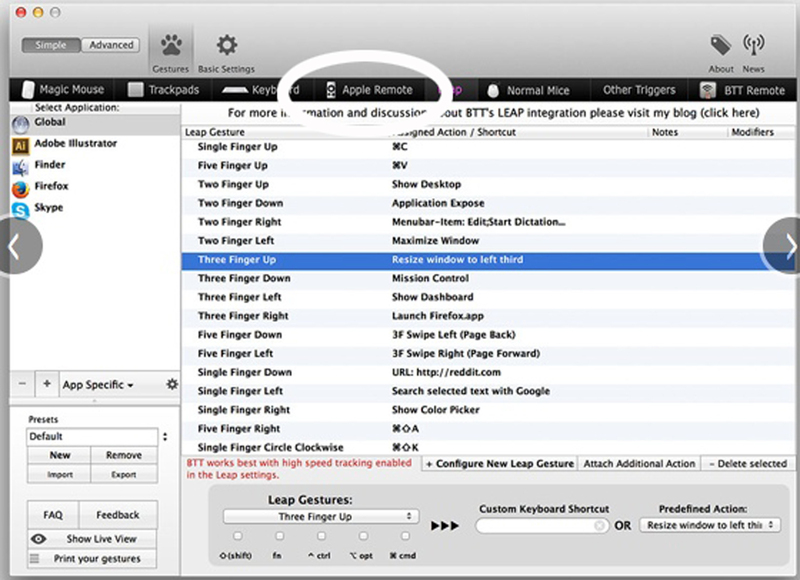 Clicking on the ‘Add Action’ button allows actions to be specified which replicate keystrokes or mouse movements; a third possibility is to run an AppleScript. 8. The special action is chosen in this area. 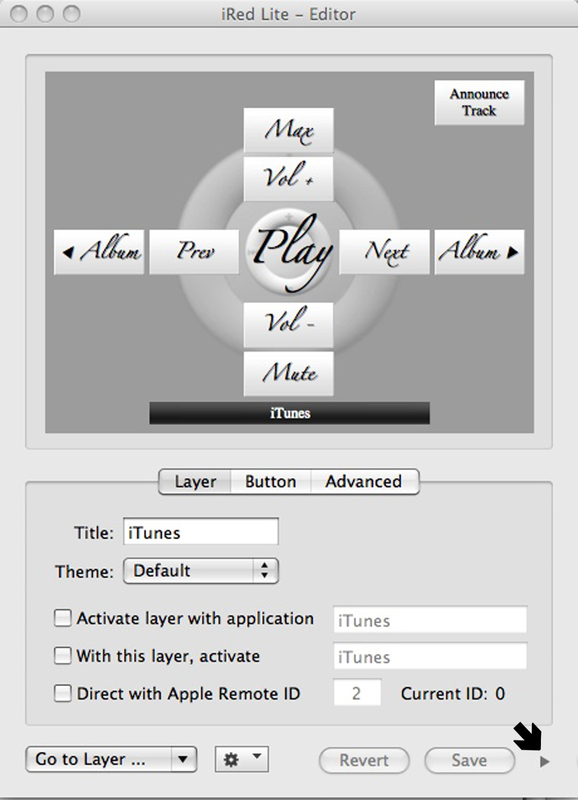 The picture shows a simple AppleScript to initiate an iTunes function. Actions can be dragged and dropped onto the buttons in the panel on the left and different patterns of buttons can be created for ease of understanding or to match modified remotes. Modified remotes is the subject of Part 2 of this series of posts, but before we leave the topic of software, I must just mention a small command-line app which runs from the Terminal. I haven’t yet worked out if this is potentially useful or not yet, but it’s called iremoted and ‘listens for button-press events and prints the identifier (the HID element cookie, to be precise) of the button in question’. A description of the program can be found here, together with the source code in a file called iremoted.c. Its GitHub entry is here. I compiled it from the Terminal by typing the recommended instruction ‘gcc -o iremoted iremoted.c -framework IOKit -framework Carbon’. It’s interesting that ‘+’ and ‘-‘ were the only two buttons that showed an entry when pressed before another entry when released. 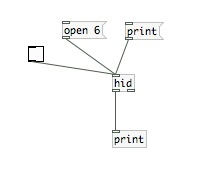 Whether this has anything to do with the fact that they were the only two buttons to show up in PureData, I don’t know. The above isn’t the only information passed via the infra-red link when a button is pressed. I’ve read numerous articles on the subject which, frankly, I don’t understand – they either don’t say the same thing, or they say the same thing in a different way . . . suffice it to say that 4 different pieces of information are transmitted each time a button is pressed, according to the NEC Infrared Transmission protocol, which Apple remotes use (in a slightly non-standard way): the first two are purely Apple’s own ID, the third is the instruction code, as above, and the fourth is the remote’s individual ID. The individual remote ID is the final thing I want to deal with in this post – which I ought to do, as I glossed over it rather surreptitiously when talking about ‘pairing’ earlier on. 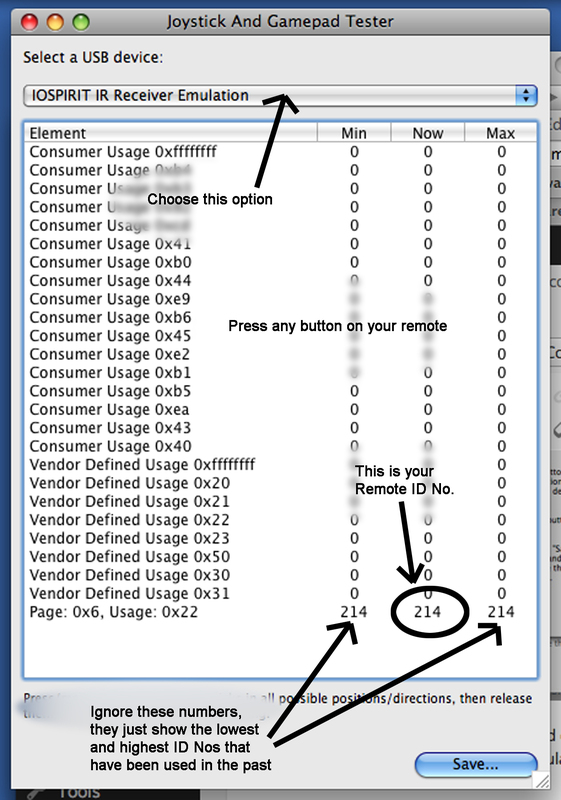 When you pair a remote with your computer, you’re not pairing just any remote in the vicinity: you’re pairing a particular remote; and the way the computer knows which particular remote is being paired is because of its individual ID, which is a number from 0 to 255. This isn’t fixed: it can be changed, although not to a number of your choice. The advantage of pairing a remote is that you can – as in my earlier example – ensure, in an environment in which several remotes might be in use, that your computer responds only to your remote. If by some chance you find yourself in a situation in which there are two remotes with the same number, you can change the number and re-pair it. To change the number, all you do is press ‘Menu’ and ‘Play’ (the centre button) at the same time, and the number will increment. I have read that the remote will attempt to pair when you do this, so if you don’t want to pair at the same time, do this outside the distance from the computer (3 or 4 inches) which is required for pairing to work. 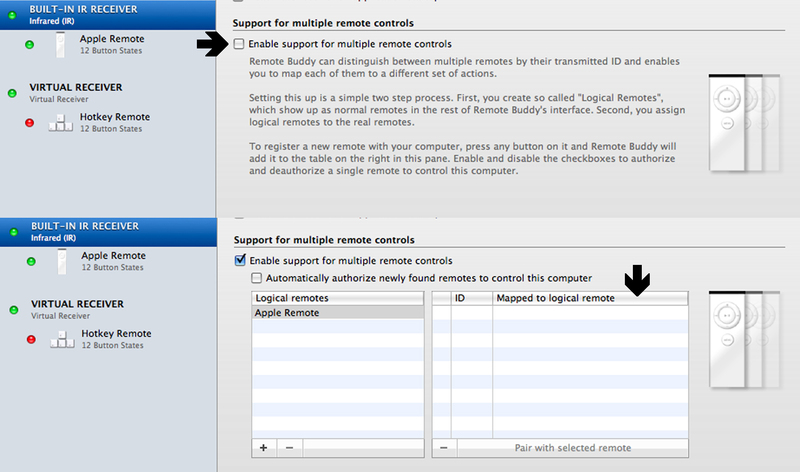 Checking the box ‘Enable support for multiple remotes’ – indicated by the arrow at the top – brings up the list beneath. In the right-hand column, remotes are distinguished by their ID number, not paired, but associated with different ‘behaviour’ groups. 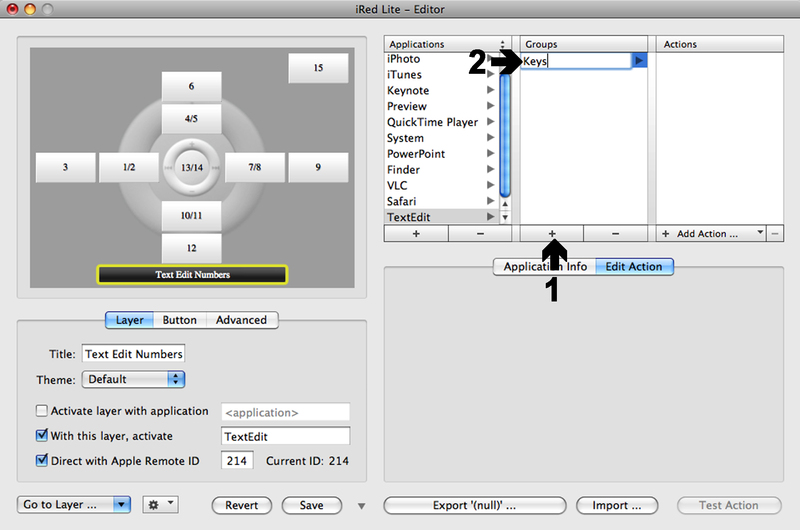 In the iRed Lite Editor window, clicking on the ‘Layer’ tab brings up a number of parameters that can be altered, one of which is the ID of the remote which will control this layer. The actions described will not be performed by another remote with a different ID. This raises the possibility of using a number of separate remotes for entirely separate purposes, using modified remotes with multiple ‘personalities’, or teaching a universal remote with a learning capability to mimic remotes with different IDs. This article: http://funwithcomputers.wordpress.com/2008/03/01/using-the-harmony-880-remote-with-your-macs-built-in-ir-port/ describes a project to teach a Logitech Harmony 880 to imitate 8 Apple remotes via Remote Buddy. In this way 48 different buttons were created (could have been 96, but long presses were not configured) and all manner of things could be controlled in a home theatre set-up. At some point, you might want to check the ID Number of your remote. If you’ve only got one, chances are its number will pop up everywhere. If you have more than one, someone else uses one in the vicinity of your computer, or you haven’t really used it before, here are two ways to find out what it is. 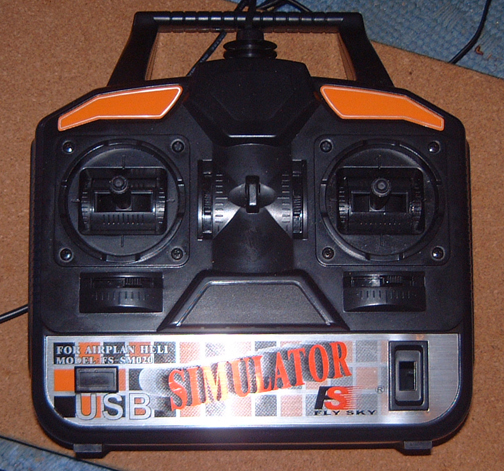 Another useful program you could use for this purpose is Joystick and Gamepad Tester. 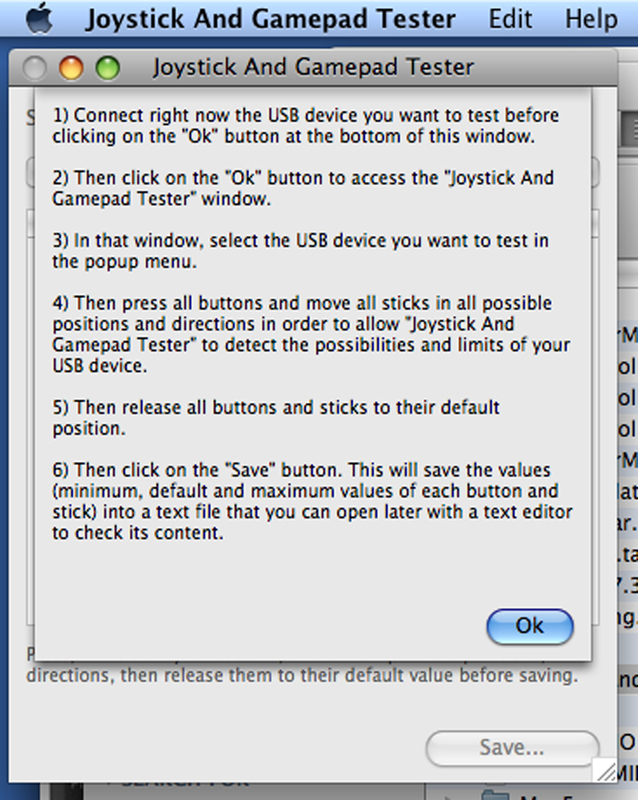 I’ve blogged about this at greater length elsewhere, but since the Apple infrared receiver is part of the USB system, it will be picked up by this program, which is designed to identify buttons and other controls on USB devices (such as joysticks and gamepads). In my experience, this only worked after I’d installed Candelair, as recommended above. A list of buttons and functions appears, the last being the Remote ID number. Pressing a button on the remote shows the current ID number in the ‘Now’ column. Any button will do, as the device’s ID number is transmitted as part of every message. Don’t take any notice of the ‘Min’ and ‘Max’ columns, as they just show other device ID numbers that may have been used before. Some of the above could only legitimately be described as ‘fun’ by those of us with a rather esoteric definition of the word. In Part 2 I’ll progress closer to using the IR remote for modification and music-making purposes. I recently came to use the Black Widow sample manipulator again and decided to make some improvements to it. Initially, I improved some of the existing features: what I had at first perceived as ‘unreliability’ in its responses to button commands was really only a difficulty in making the required number of presses to ‘fix’ volume, filter or pan settings on a sample. This involves making one, two or three quick presses on the hatswitch button – like making a single, double or triple mouse-click reliably – not perhaps one of my best ideas, and a little difficult to execute, especially without any feedback as to whether the fix had been made or not. So I added indicators to show if the fixes were on or off. Above each array are also indicators ‘REVERB ON/REVERB OFF’ and ‘ECHO ON/ECHO OFF’. I thought simple versions of these two effects would be useful, and added them to each of the output stages. Having run out of buttons on the Black Widow, these effects are manually turned on and off by using the ‘W’ and ‘E’ keys on the computer keyboard. (Although ‘E’ makes sense for echo, ‘W’ doesn’t for reverb, but I chose these two letters so as not to conflict with another program I commonly use, where ‘R’ and ‘V’ have particular functions; and ‘W’ happens to be next to ‘E’). Also, on the right-hand side, indicators for ‘Auto Speed’ and ‘Number of sections done’ refer to the next change I made: a function to allow the Black Widow program to run automatically. It’s designed to do this in a similar way to the way it’s operated manually: one sample at a time is operated on, and there are built-in delays between stages to allow a particular selected combination of settings to play for a while before being changed. It’s possible here to fix any parameter, so it cannot be changed during ‘auto’ mode; and to fix any sample to play back at normal speed, full volume, average filter setting and centre panned. Finally, I added a third section in which samples can be recorded into the arrays, rather than loaded from existing sound files. 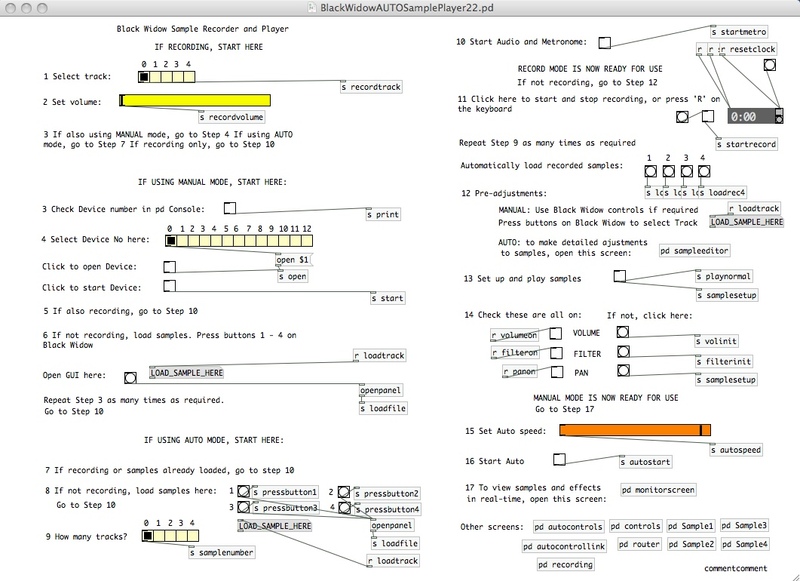 This could be useful for variety in a ‘live performance’ in which short samples (90 seconds is PureData’s default maximum) could be recorded and almost immediately loaded and manipulated, manually or automatically. It looks a bit complicated, but I haven’t mastered the method of producing a neat GUI; however, it works fine, and is easy to use if the numbered steps are followed. A link to the PureData patch for the Black Widow Sample Player and manipulator can be found in a later post in this series. The next one is here. The 4 short samples used here are a recording of a park, birdsong, running water and a live performance of the Cracklephone. If you imagine that the trackpad is slightly smaller than the trackpad on a laptop, this gives you an idea of just how tiny the keys are – but I was still able to press the correct key when required. In case of difficulty it comes with a stylus and a small attachment which fits on the end of the finger, with a point underneath it. Mine was about £10 off eBay, but I don’t know how readily available they are now: the one you see these days is a wireless version which costs a bit more, between £15 and £20. There are now some similar items – also wireless – styled rather more like TV remote controls, which look as if they might have larger keys. Also worth mentioning here, if you’re interested in this kind of thing, is the work of Karlheinz Essl. You can read about him here: http://en.wikipedia.org/wiki/Karlheinz_Essl_junior and on his website at http://www.essl.at/. Of particular relevance in relation to the Black Widow project is one of the various programs Essl has created for sample manipulation, fLOW, which is described like this: ‘fLOW . . . generates an ever-changing and never repeating soundscape in real time that fills the space with flooding sounds that resemble – metaphorically – the timbres of water, fire, earth, and air. 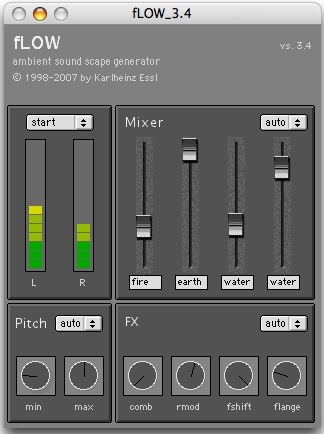 This ambient sound scape generator adjusts itself through various parameters and controllers that are represented in real time on your screen.’ It comes with four samples, which are are loaded and manipulated automatically via a comb filter, ring modulation, frequency shift and a flanger, but you can also load your own samples into it for a more personalised experience. 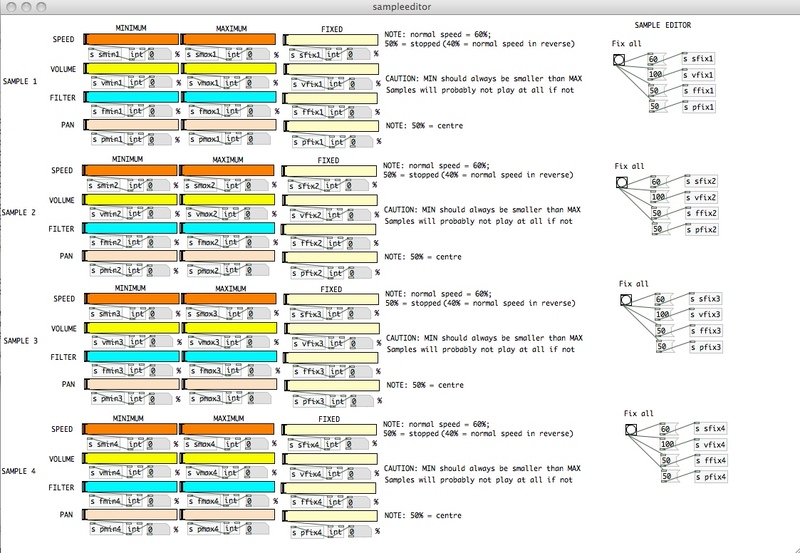 You can read about fLOW and download it from http://www.essl.at/works/flow/download.html. I don’t remember how much it costs, but it isn’t very much, and well worth the money. It’s well worth reading more about Essl, too. His main preoccupation is one that I’ve become interested in in recent years: ‘music that is created at the moment of its sounding (“realtime composition”)’. Improvisation, looping and manipulation of sound and music samples are all part of the same field, and chance can play a significant role. 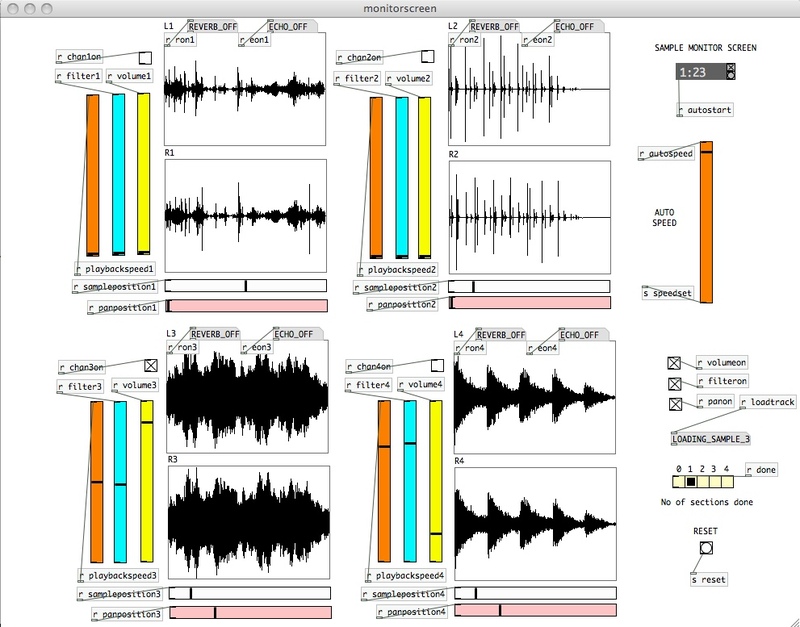 In a later post I’ll be mentioning another his programs, REplay PLAYer (found at http://www.essl.at/works/replay.html), a multi-featured program for manipulating a single sound sample. Finally, a very nice freeware program with similar features which I’ve used is Sineqube’s Sapling, which is described here: http://www.sineqube.com/blog/?page_id=157. Sapling provides an easy means to load 4 samples and vary – manually or automatically – the speed and volume of playback, and the length of a loop created within each sample. It works well with short samples and allows a very useful combination of automatic and manual adjustments to be made in real time as the samples are played, and a facility for recording the output to disk. With all of these programs, including the Black Widow in Auto Mode, I enjoy setting up the conditions and listening to the samples play, although for a more permanent record of what was created, I normally edit the recorded results. [Edit: more modifications have been made to the Black Widow Controller (although not for sample manipulation). See this post. 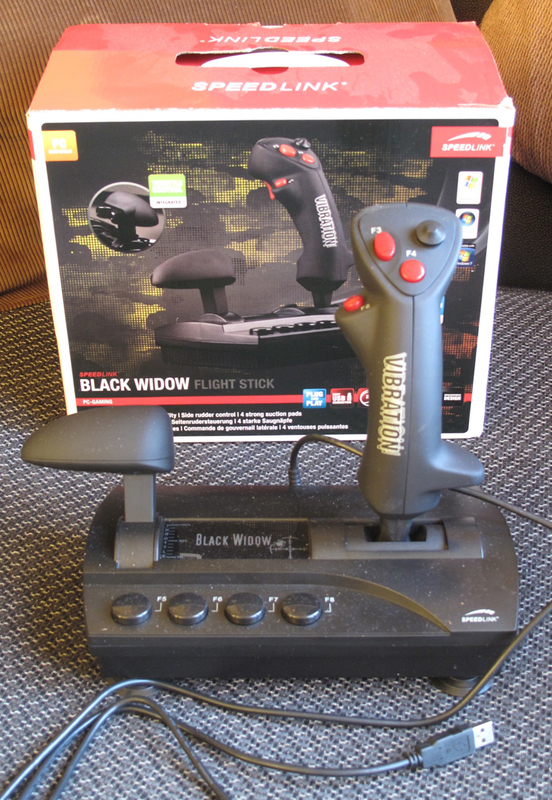 MIDI controls have been added to the Black Widow MkIII, described here].